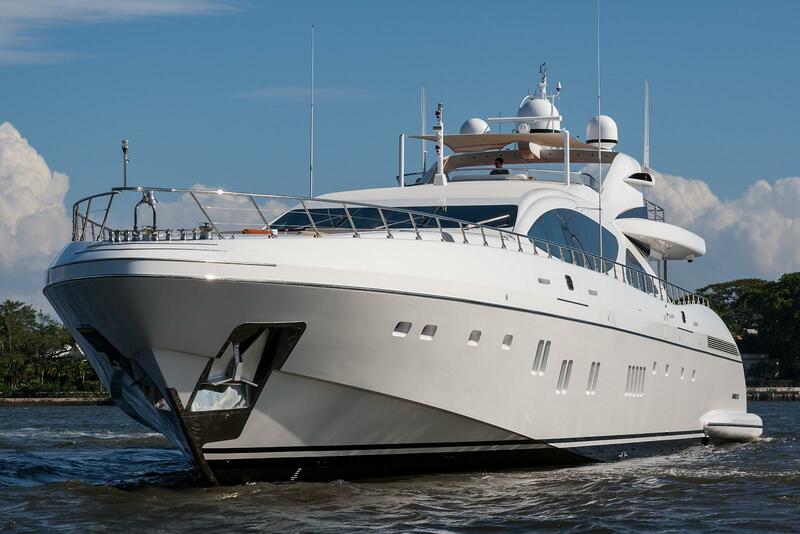 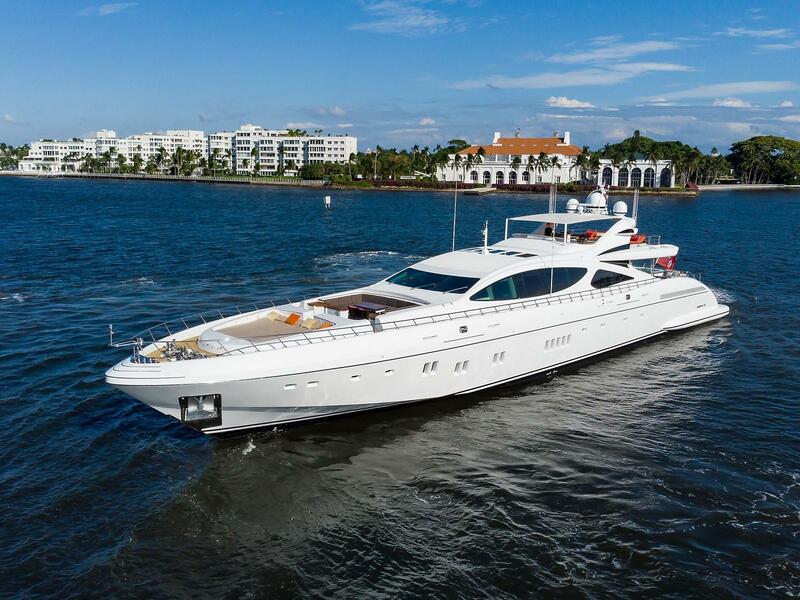 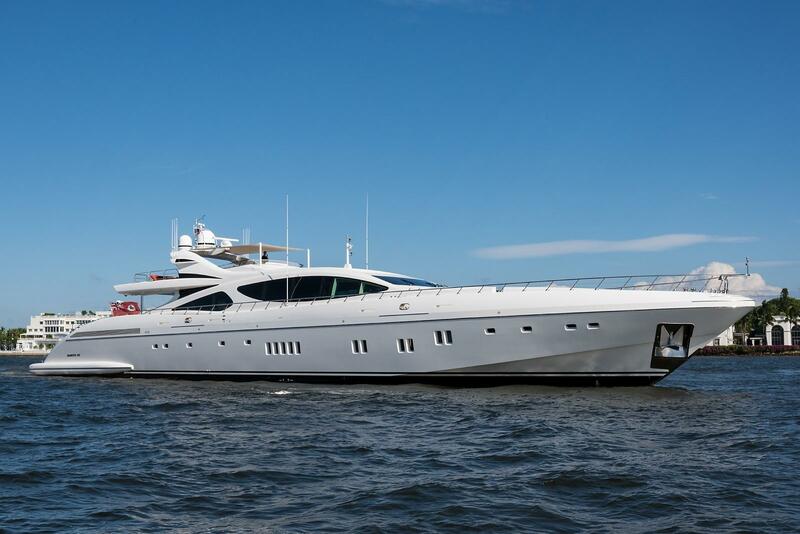 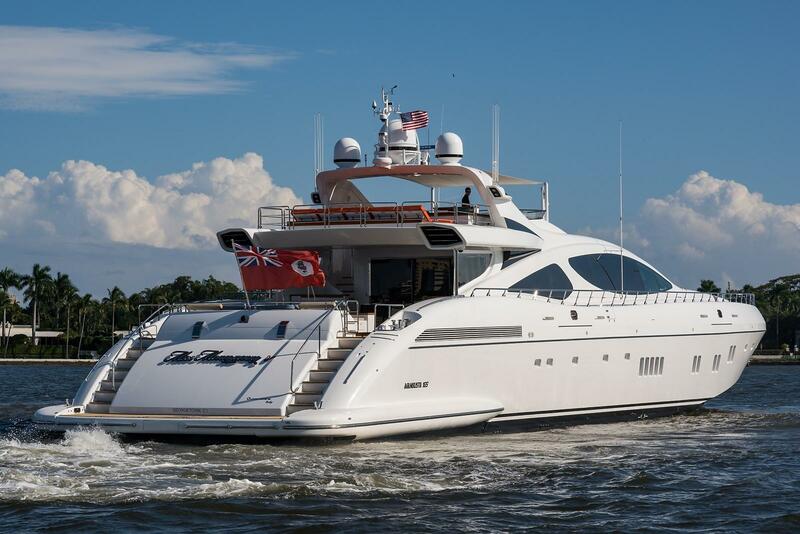 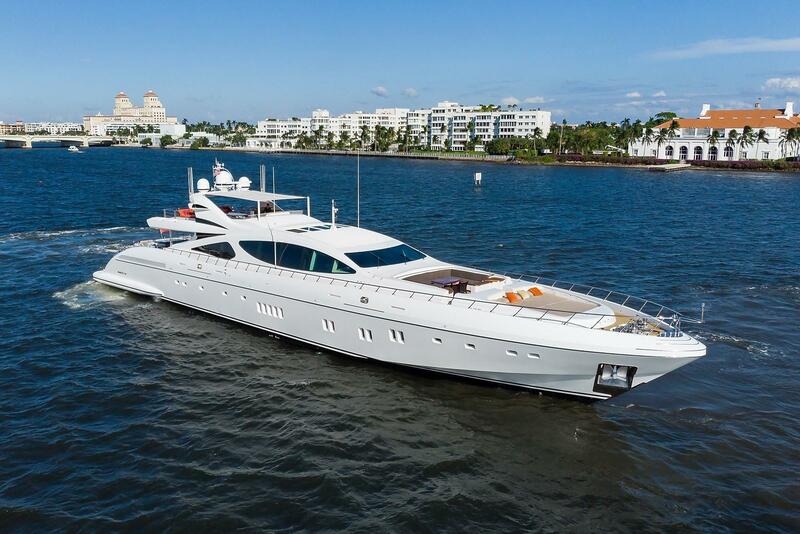 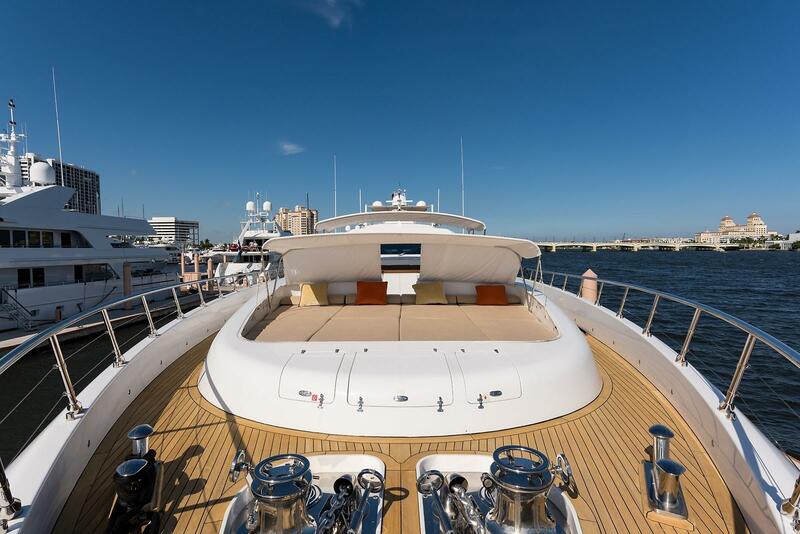 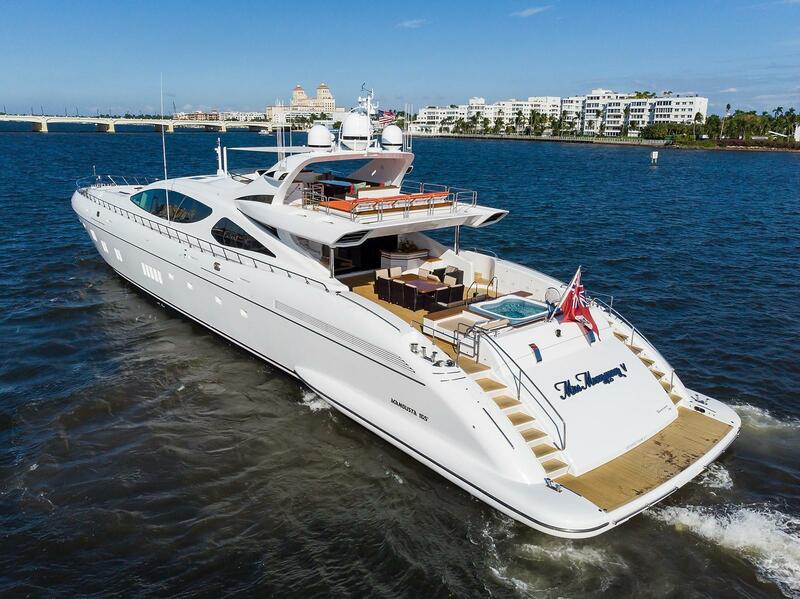 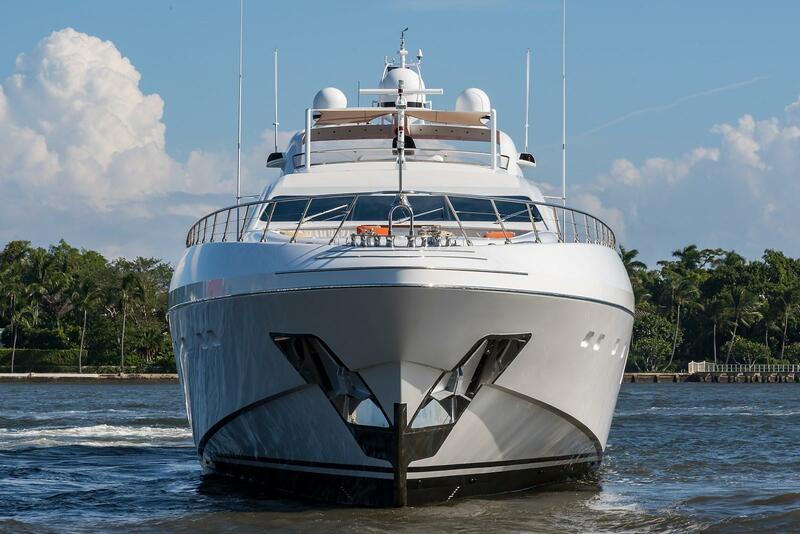 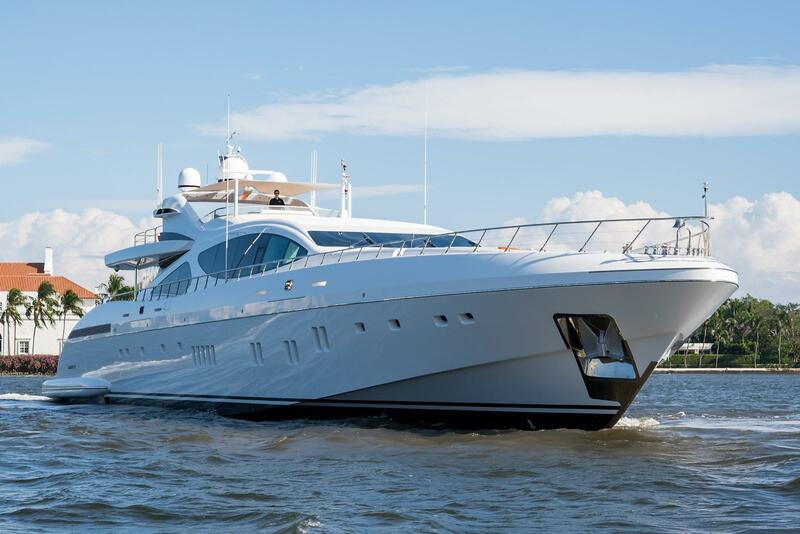 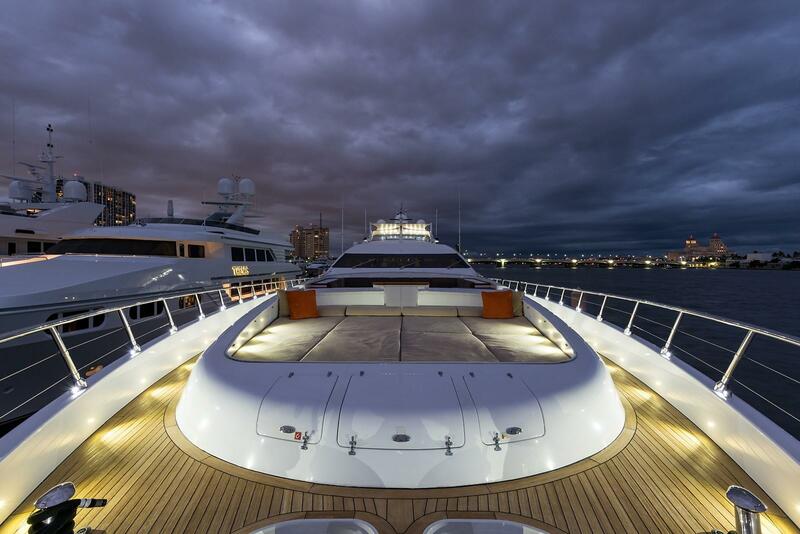 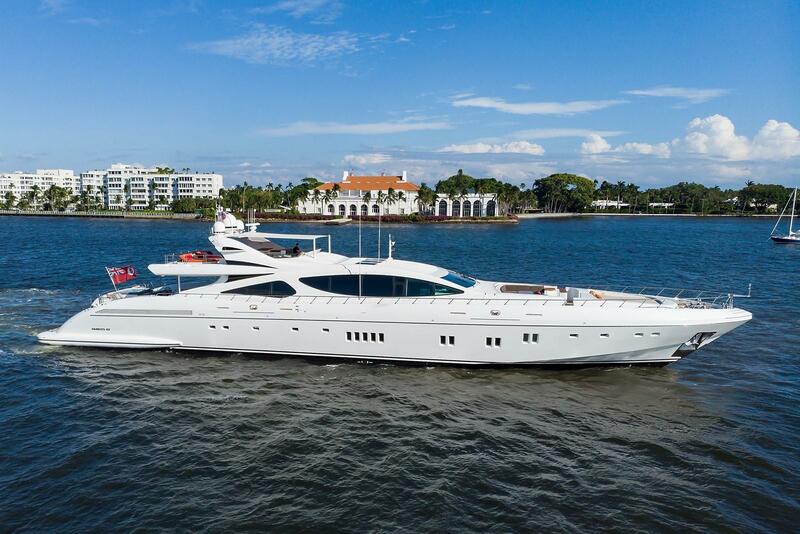 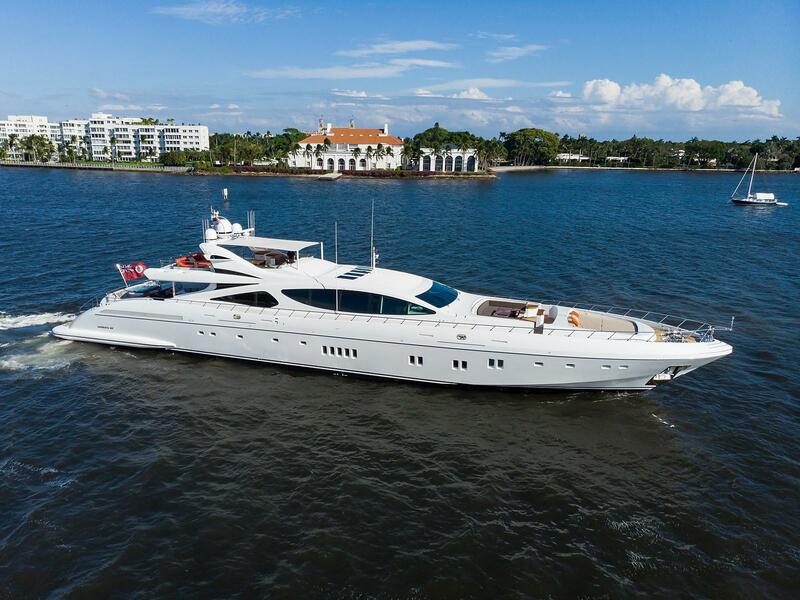 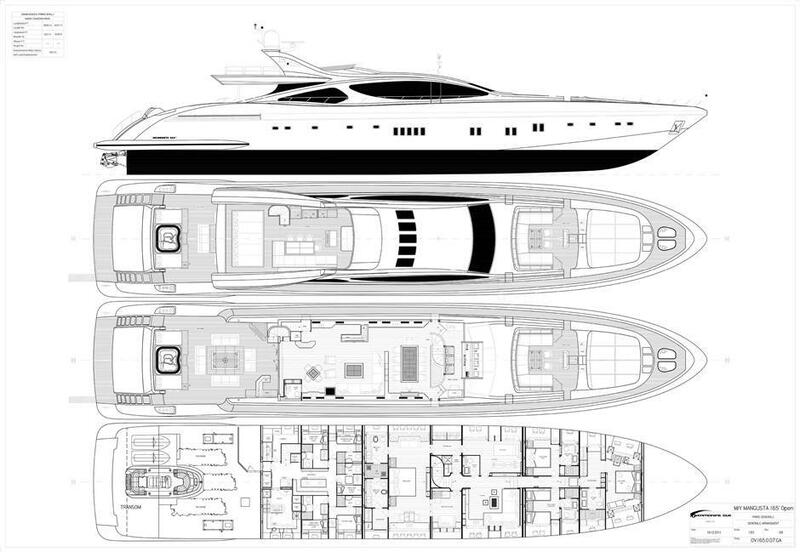 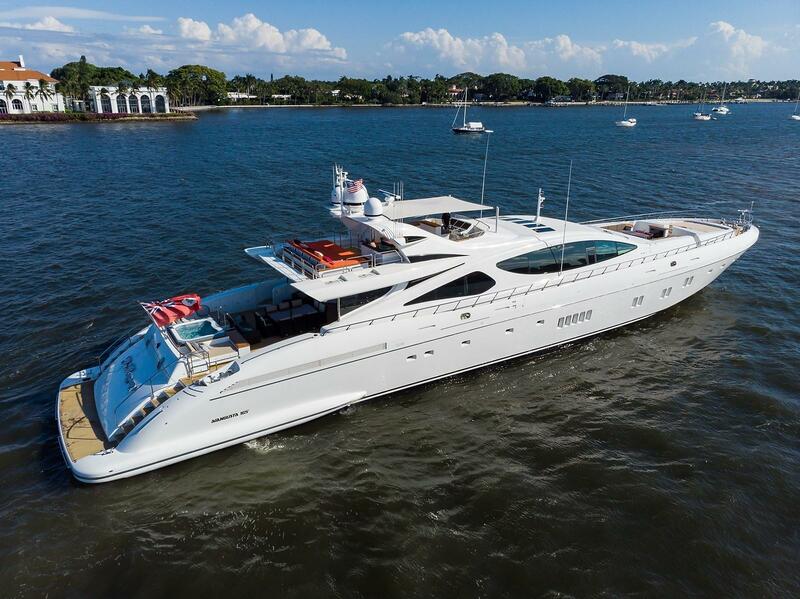 2012 Mangusta 165 Motor Yacht "Miss Moneypenny V"
Accommodations consist of Four staterooms including a massive full beam owner's suite totaling 9 berths plus a relaxing media room and exercise room and stew service pantry. 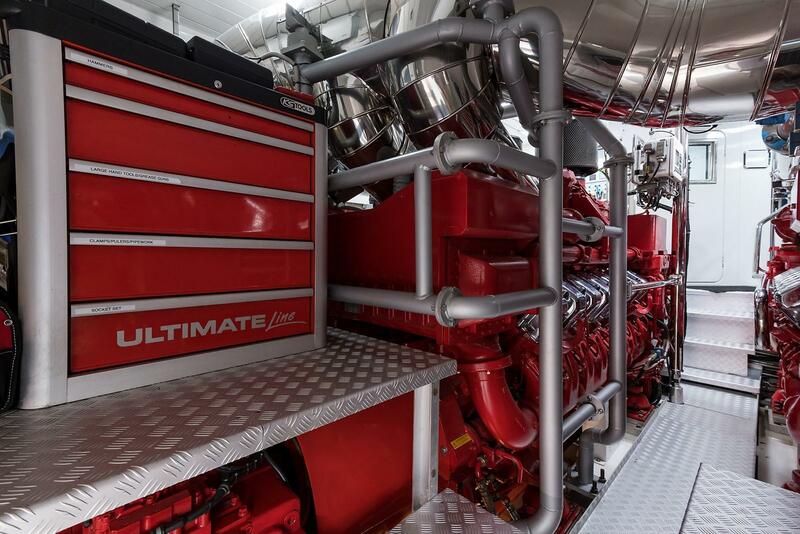 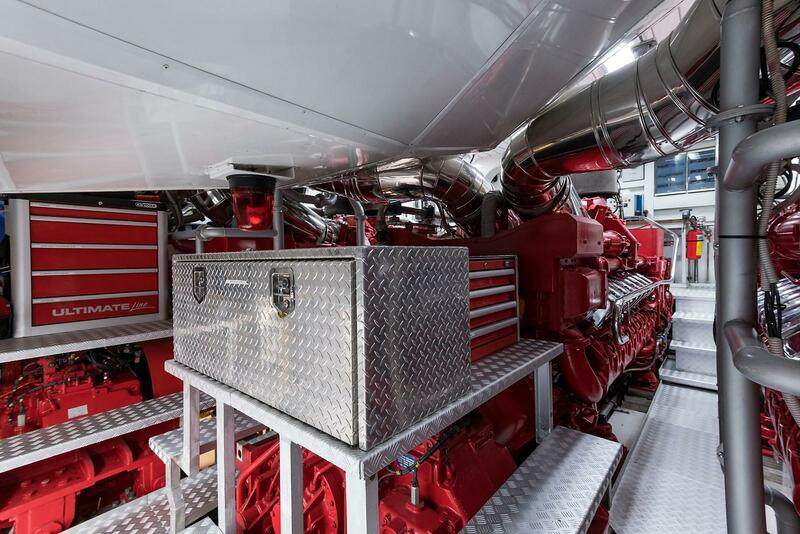 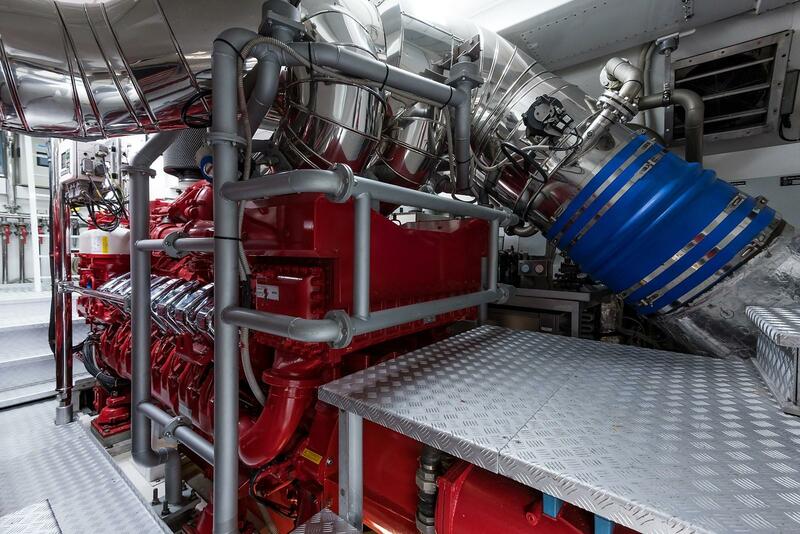 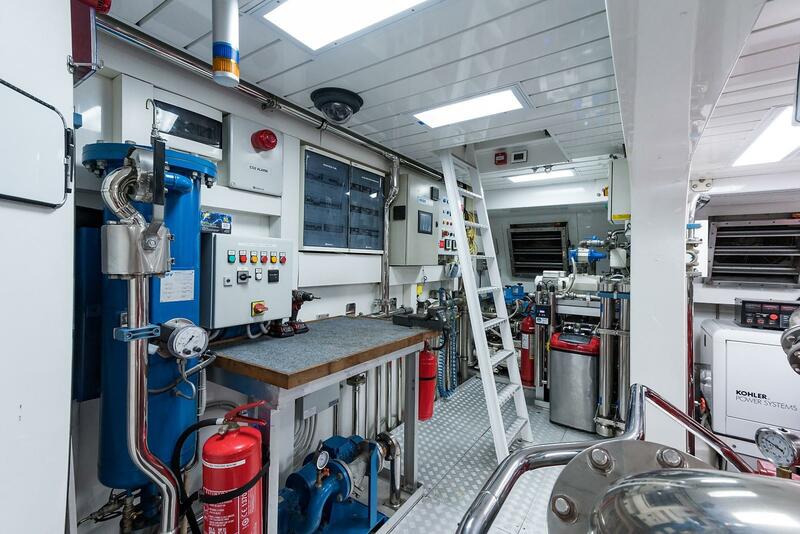 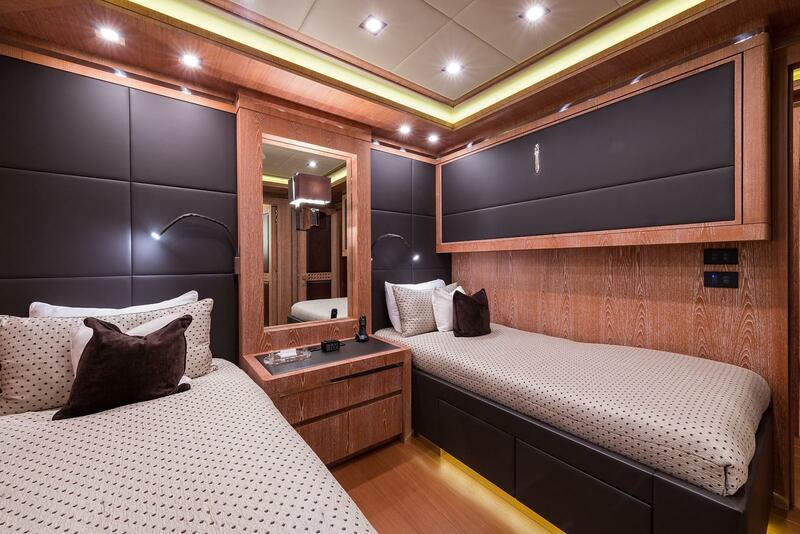 Four double crew cabins with en-suite and captains cabin with a double bed and full en-suite bathroom. 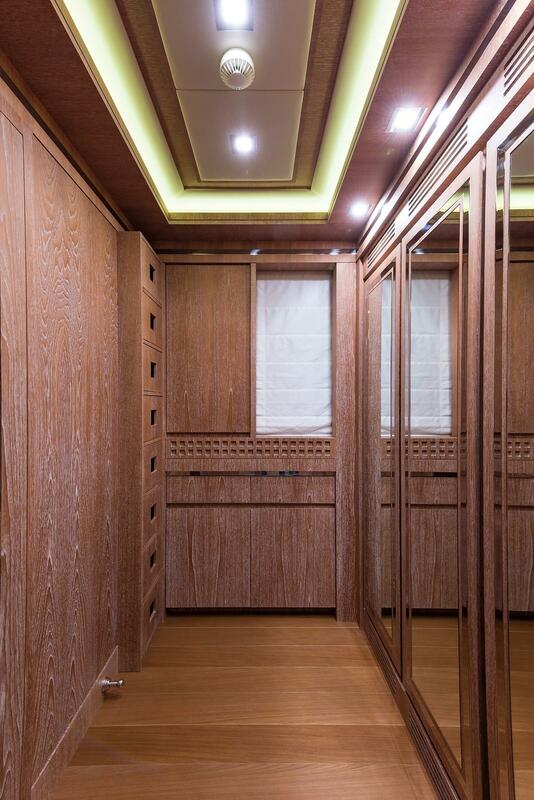 As you enter the automated salon doors you are immediately impressed with the huge volume and high ceilings that are flooded with natural light from 360 degrees of windows. 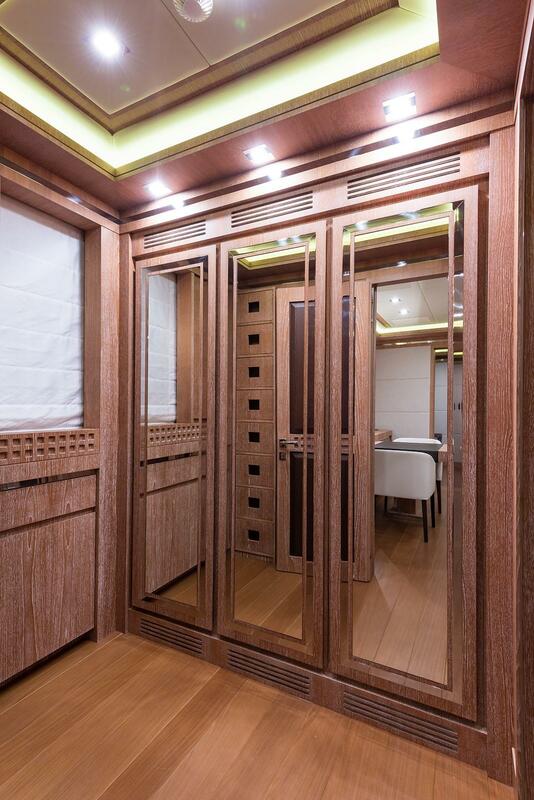 Bleached teak wood floors and lime oaked paneling and leather finishings add to the contemporary style. 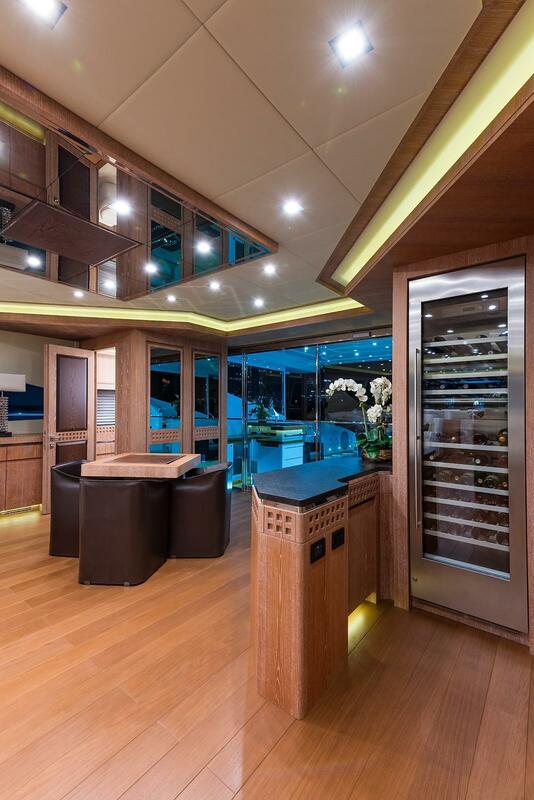 Immediately to the left is the wine bar with plenty of room for the collection with a floor to ceiling wine cooler. 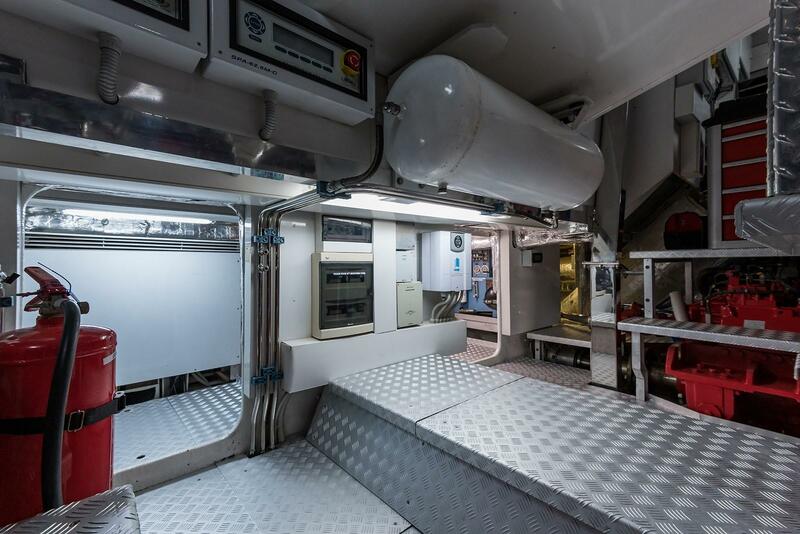 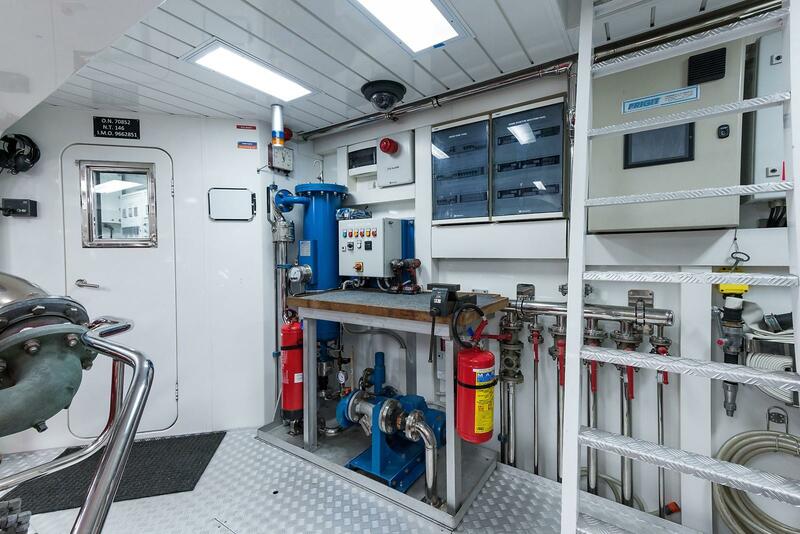 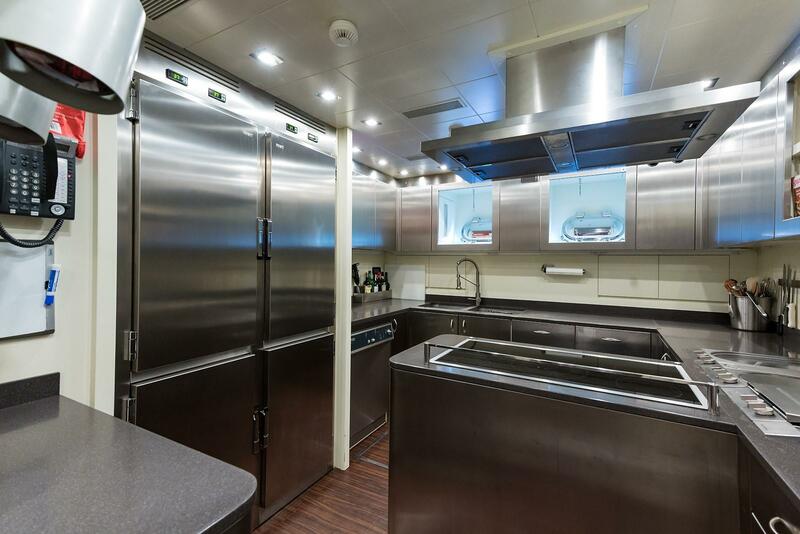 Crew access behind the bar going not only down to the galley but to a deck access door as well. 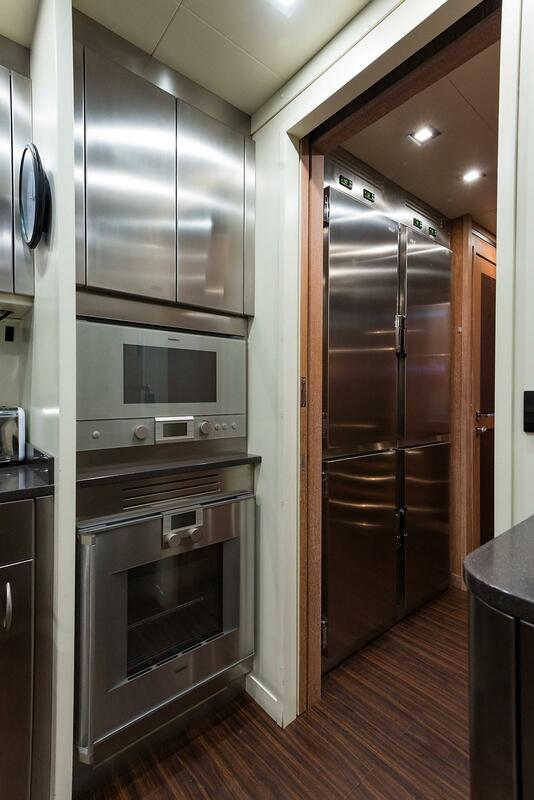 A second full bar is just forward faced with a 70" salon television, custom refrigeration, icemaker and sink with plenty of prep space for hosting. 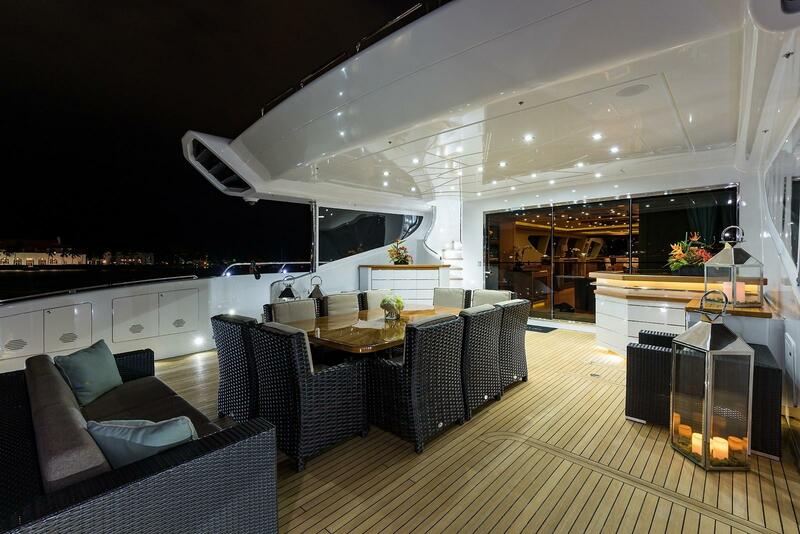 To the right is a game table for four and around the corner is a lavish day head. 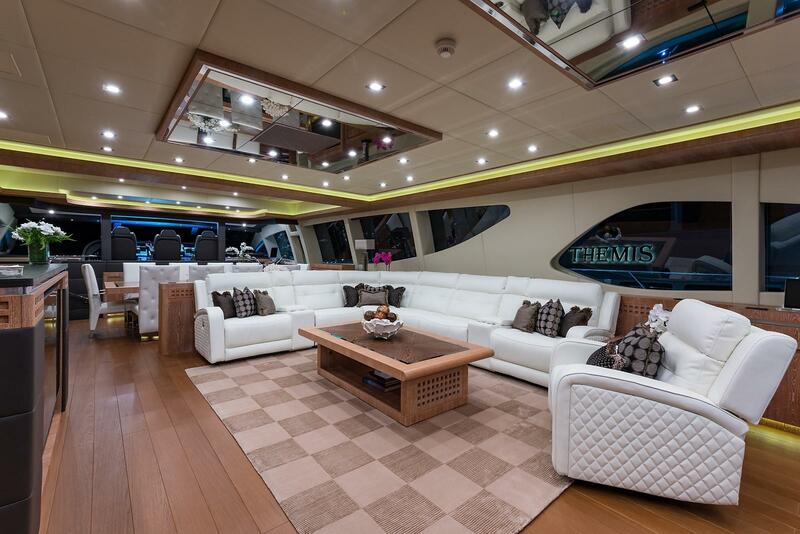 The center piece of the salon is a new white leather L shaped couch and easy chair both having electric recliner feature that is very comfortable for long range cruising or even watching movies. 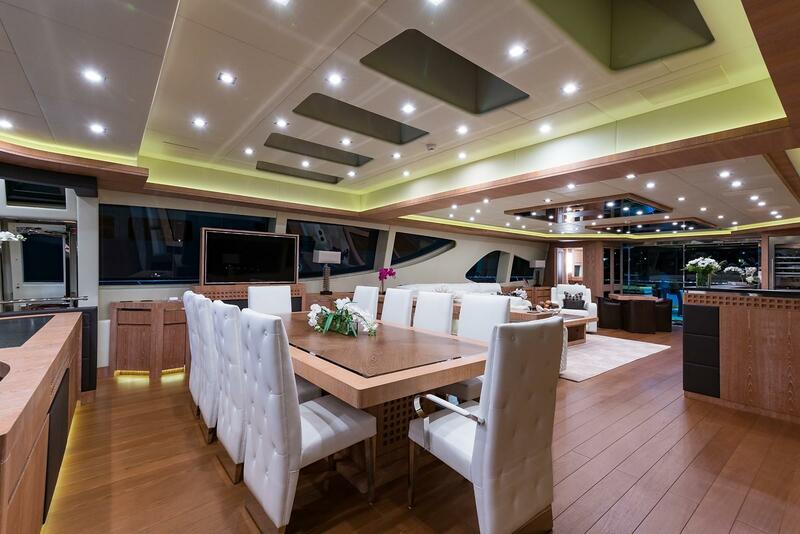 Moving forward you have ample side board storage along the port side that brings you to the open dining room with five skylights and seating 10 in new custom white leather chairs. 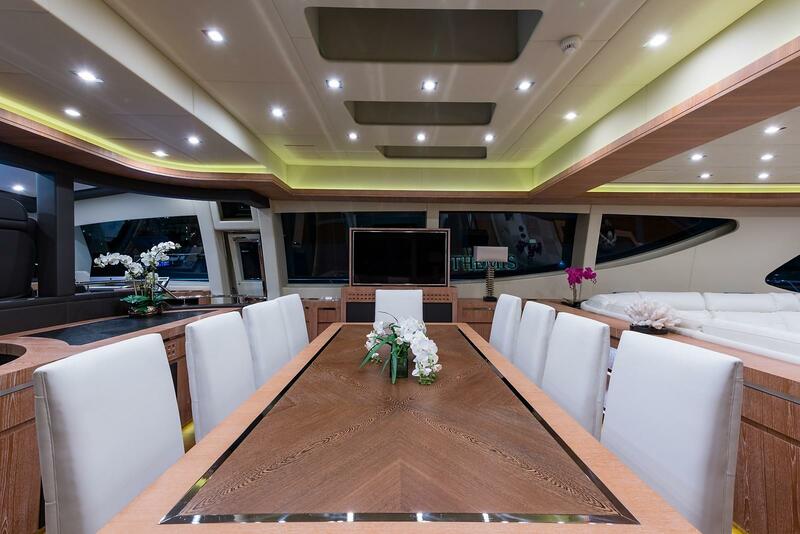 There is an additional pop up television at the end of the table to starboard. 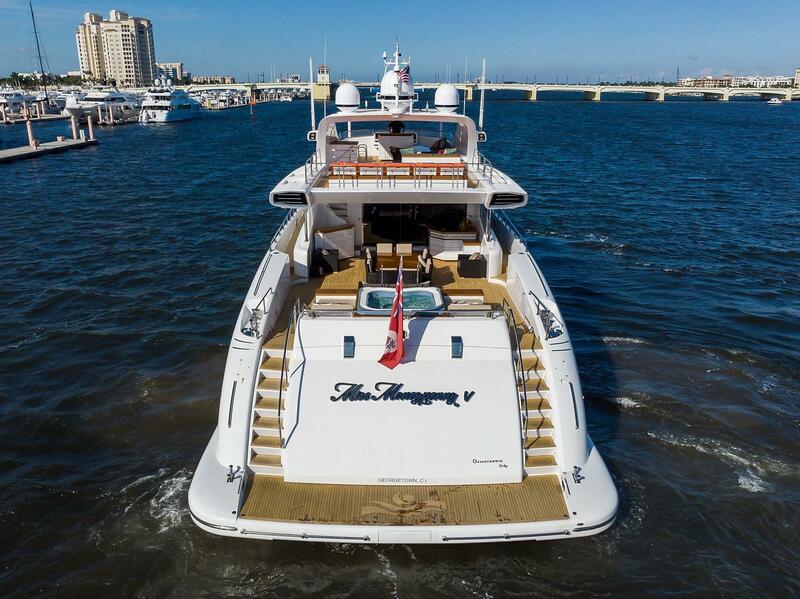 Deck access is easy with port and starboard doors forward before you take a few steps up to the helm, offering two observation bucket seats to either side of the helm seat to observe the yachts Master at work. 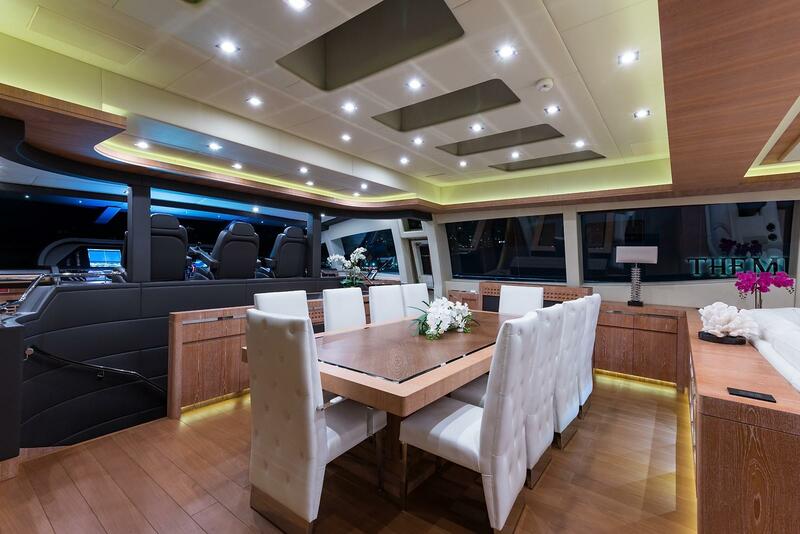 With a full beam layout of 30' and ten oversized hull side portlights you receive wonderful natural light enhanced by high ceilings and every amenity. 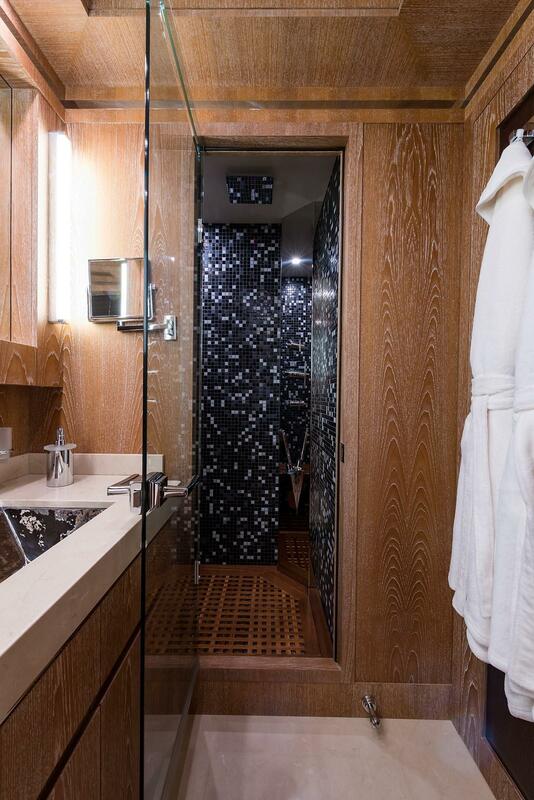 There is a king bed centerline with his and her bathrooms to either side separated by a large walk through spa shower. 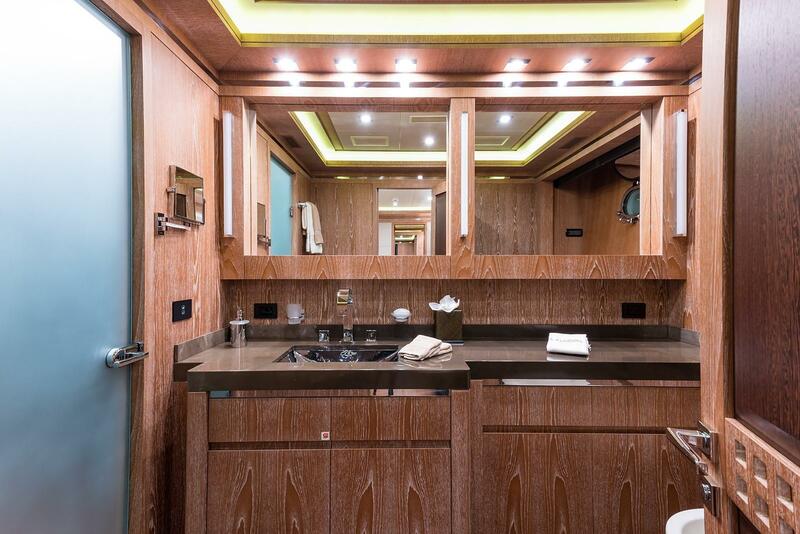 Both his and hers feature Headhunter toilets and bidets with plenty of storage. 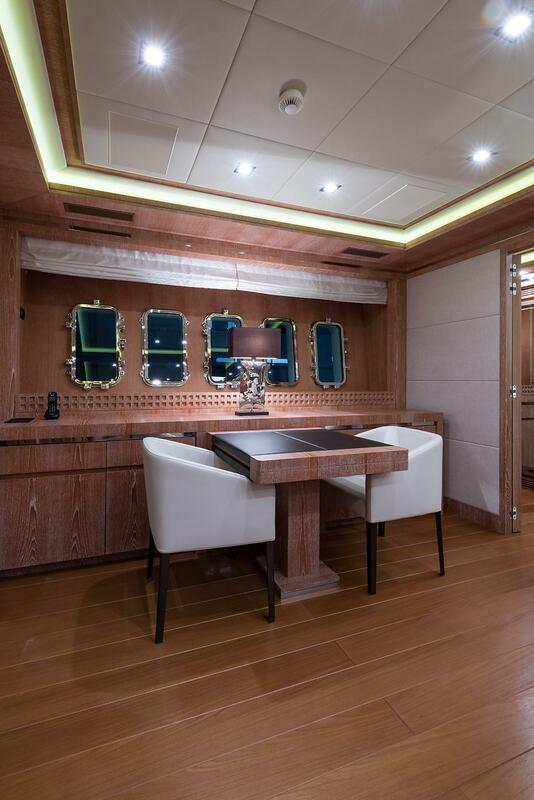 In the stateroom to starboard you have a breakfast table with two barrel chairs. 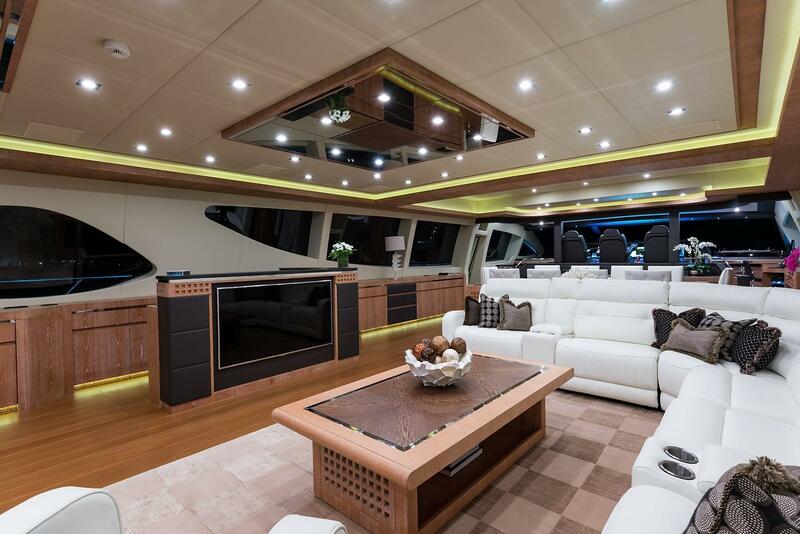 To port there is a couch with end tables and Frigit refrigerator. 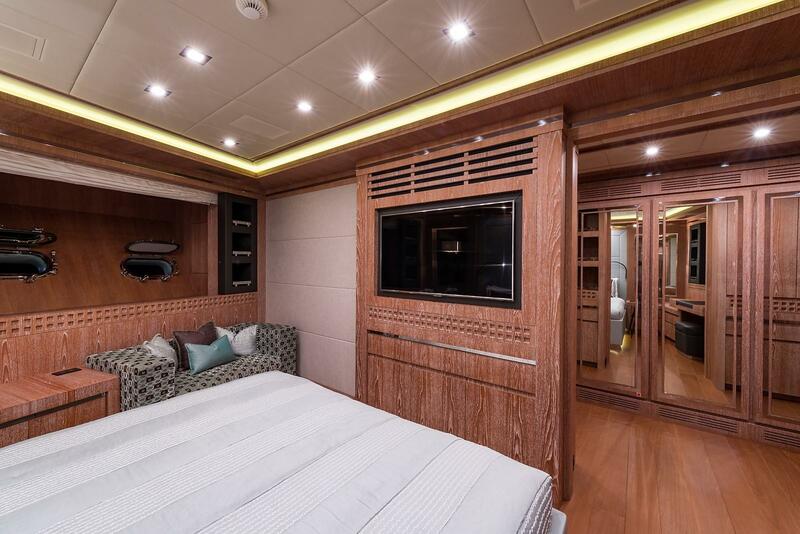 Forward is the television that features surround sound kaleidoscope system amongst the decorative alcoves with dresser drawers below. 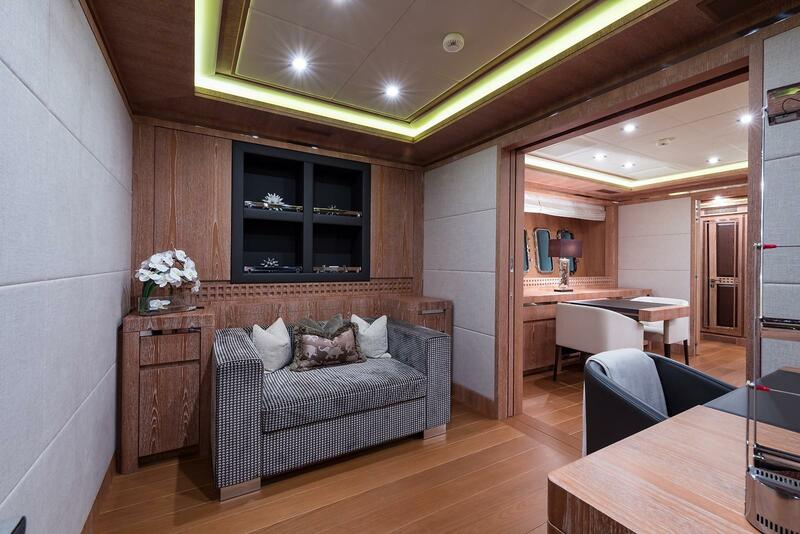 The master also features a full office which separates with a pocket door for privacy, includes a desk, TV/computer monitor as well as couch and wall cabinet storage. 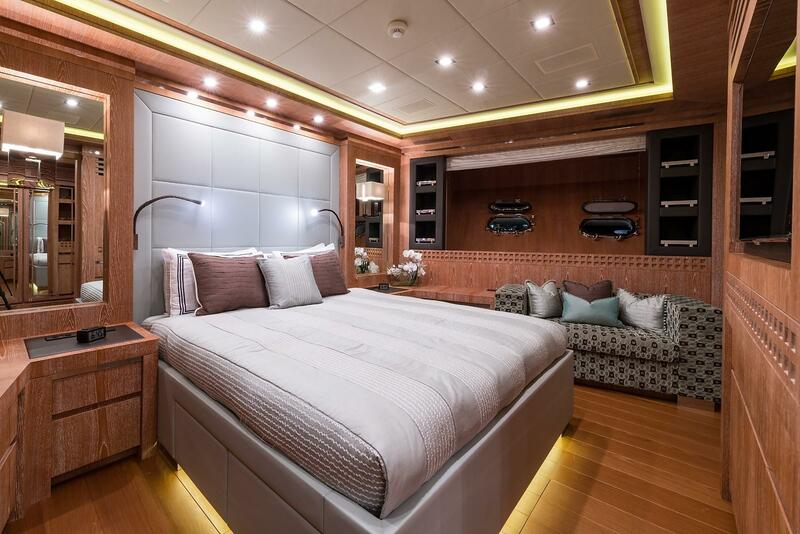 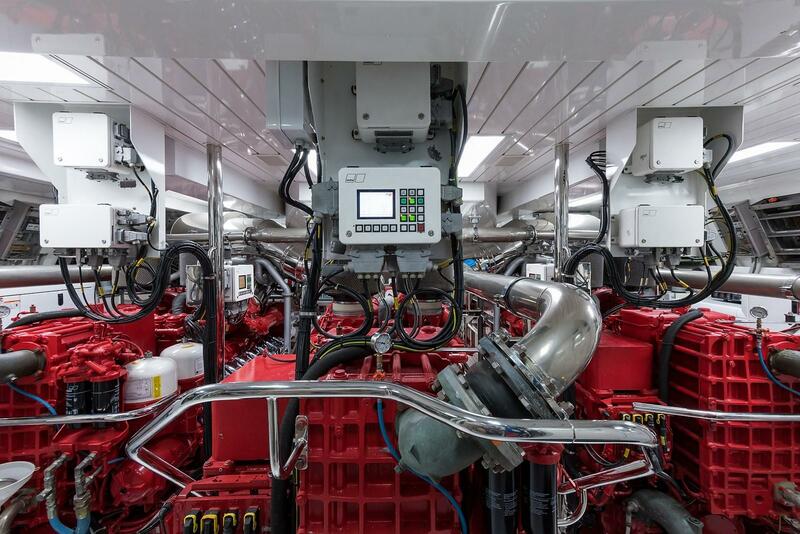 Located forward and full beam you enter through a very open area which is actually mirrored wardrobe and storage that enhances the stateroom featuring a centerline queen bed. 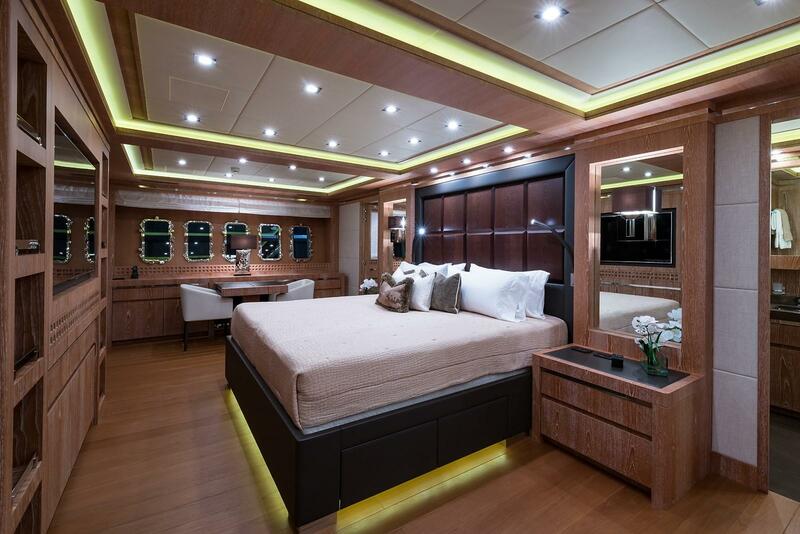 There is a vanity with stool to port and couch to starboard and an abundance of dresser drawers. 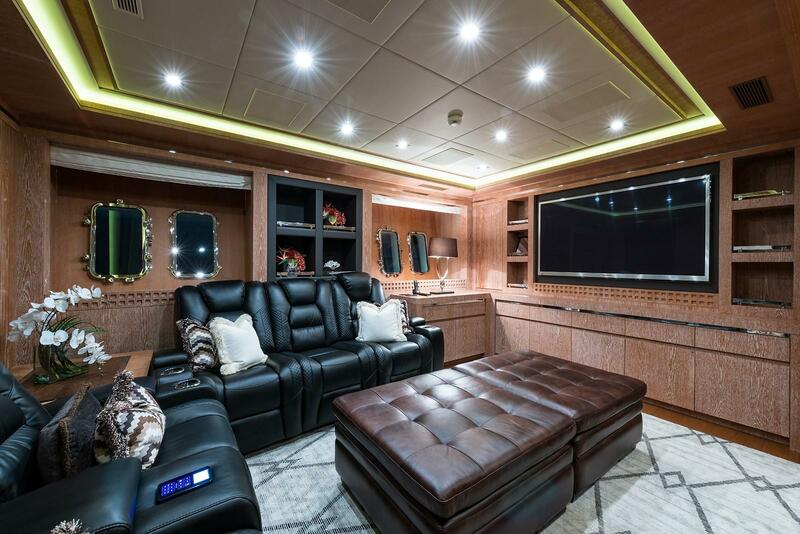 At the foot of the bed there is a television and media center again with Kaleidoscope all controlled through the ipad Crestron systems. 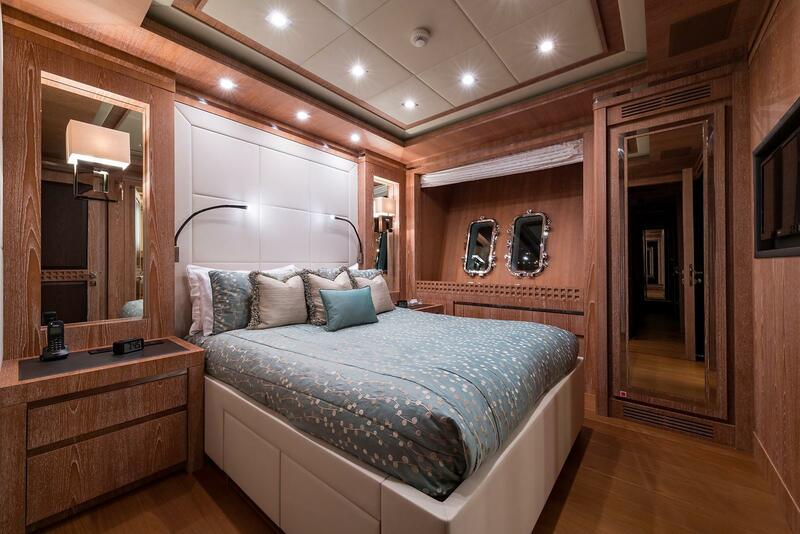 Behind the centerline bed is a spacious en-suite with double sinks and oversized shower. 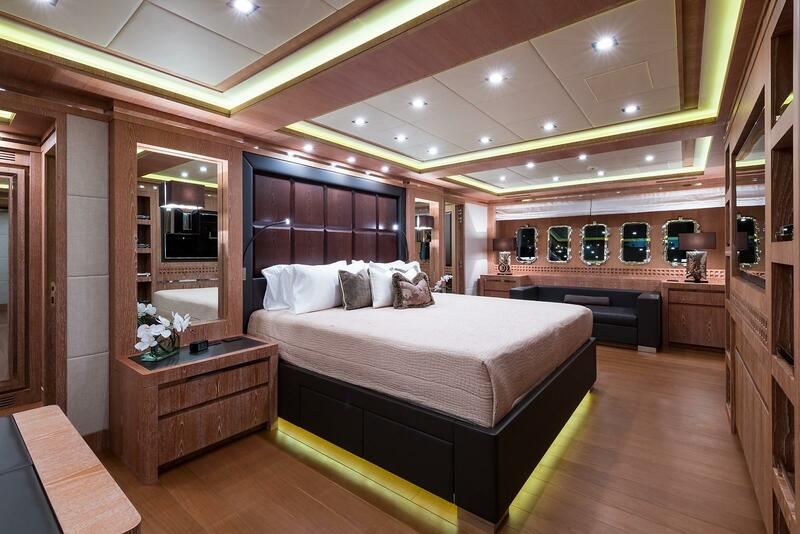 Queen bed with night stands to either side with a mirrored closet, Television and media center systems and full en-suite bathroom that is inviting for any guest. 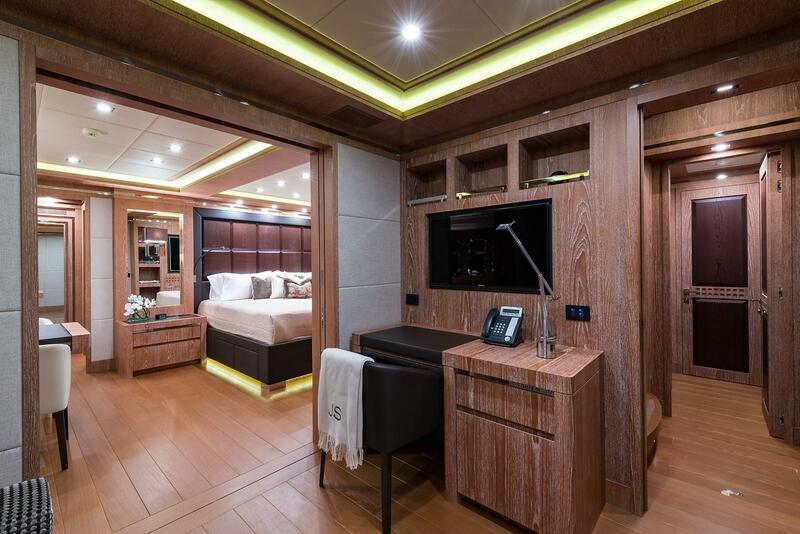 This stateroom features twin beds and additional pullman bunk for a total of three. 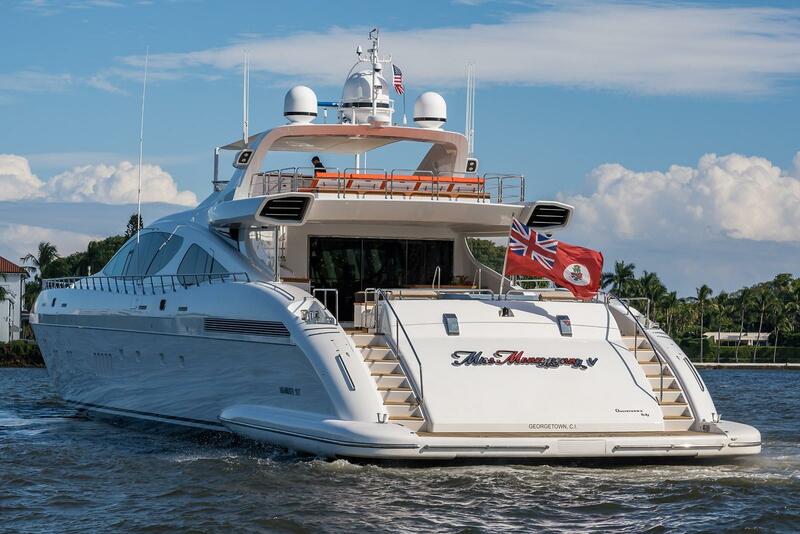 Wonderfully appointed with television and media systems and full en-suite bathroom. 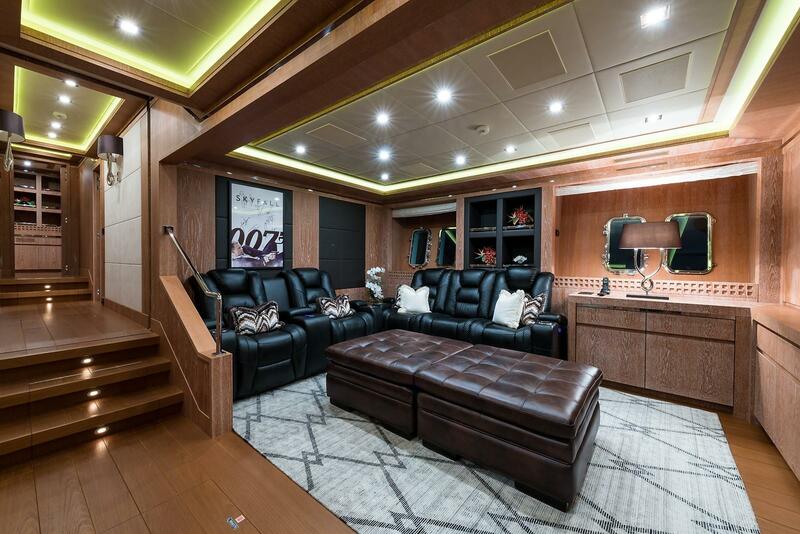 Freshly updated with custom couch recliners for five and oversized ottomans creates the ultimate relaxation area for movies. 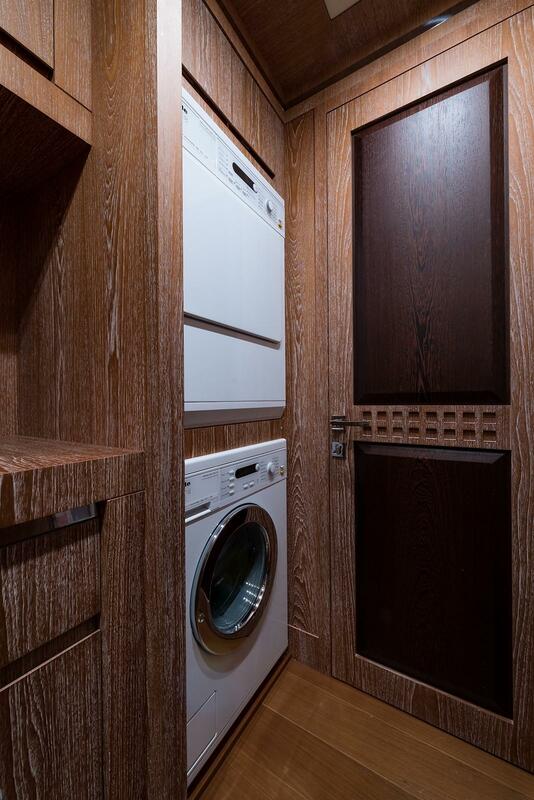 Great storage cabinets and of course full equipped with Kaleidoscope and surround sound systems. 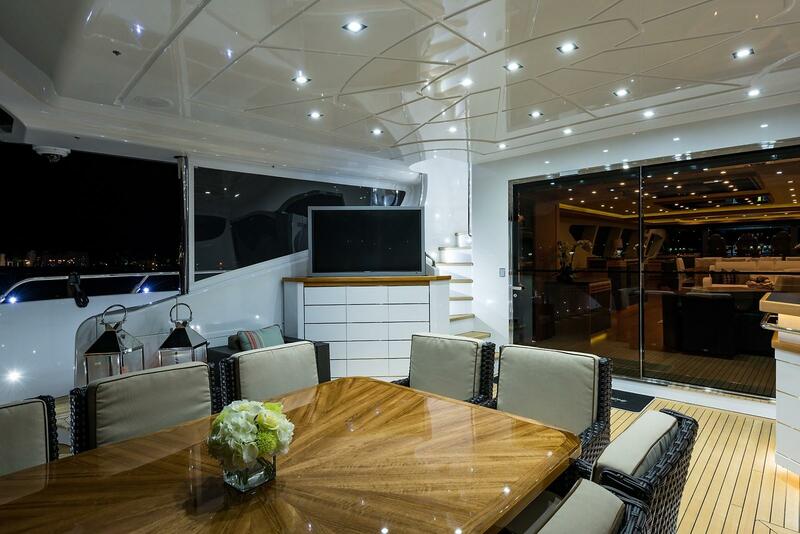 Power blinds to darken the natural light from the four hull side windows. 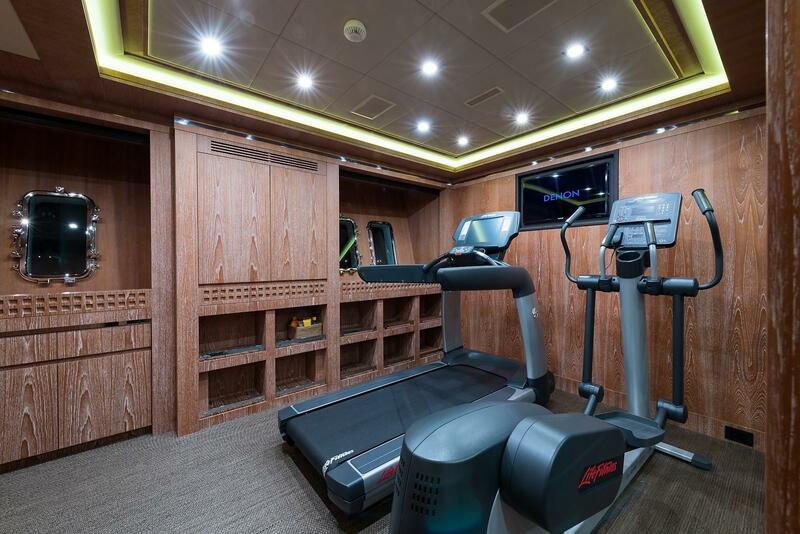 Very spacious area with great natural light from the four hull side windows accommodating a Life fitness treadmill and Elliptical machine facing a television. 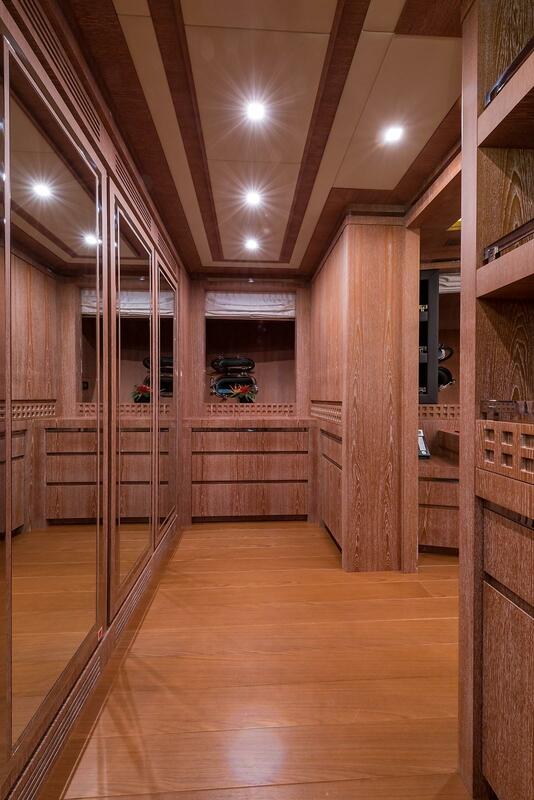 Great amount of storage cabinets for the accessories. 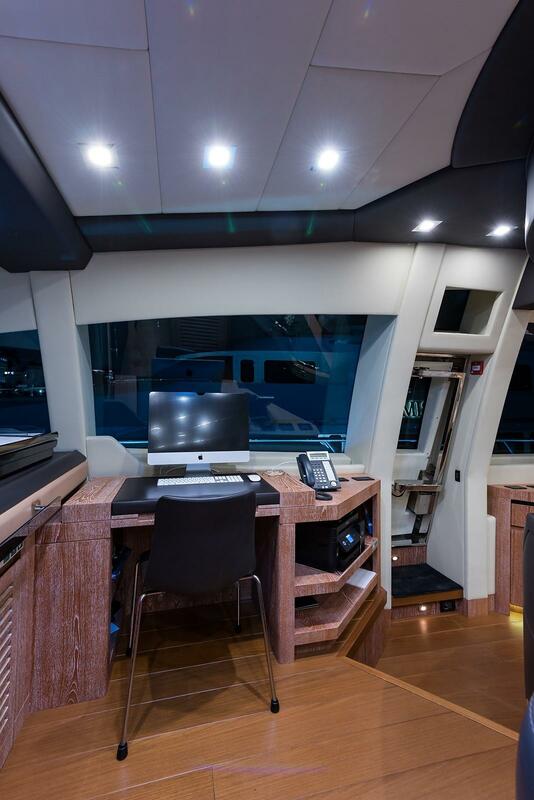 The flybridge has a full helm centerline forward with bench seat for three. 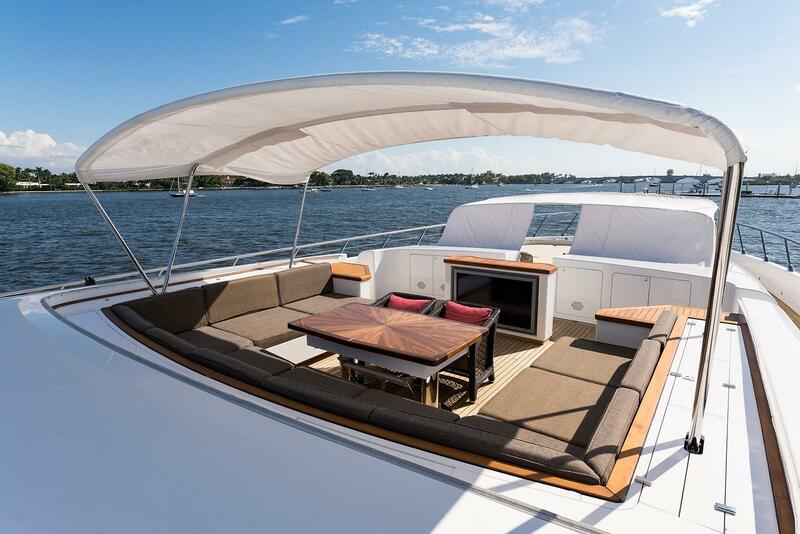 Removable overhead canvas for full sunshine. 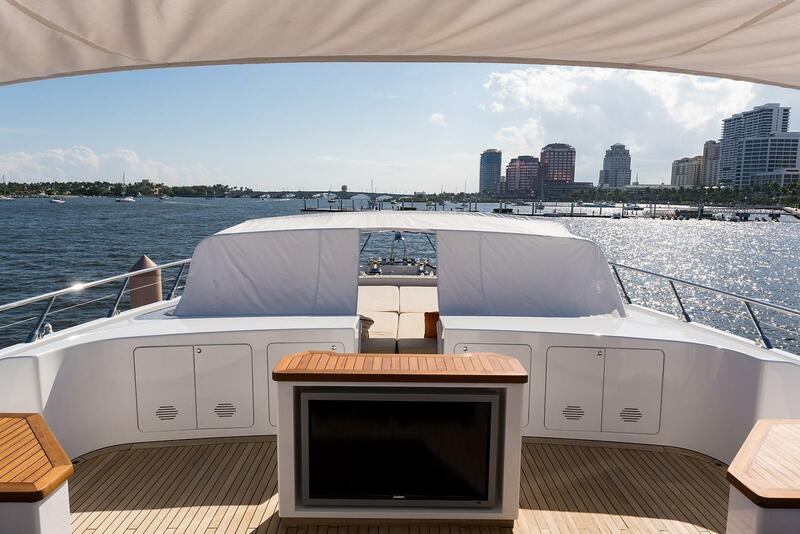 Behind the helm seat is the pop-up television facing the large L shaped lounge that can seat 8 people easy with new high gloss teak table. 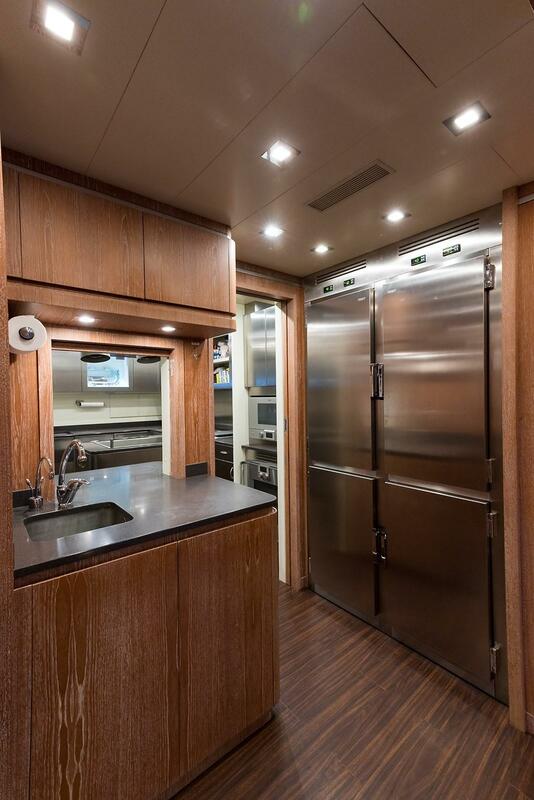 Across from the lounge is the service credenza with BBQ and sink as well as icemaker and refrigeration. 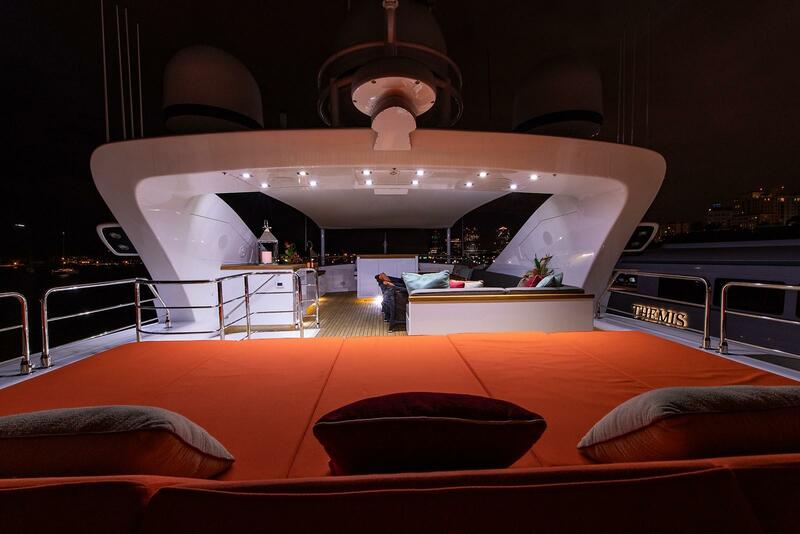 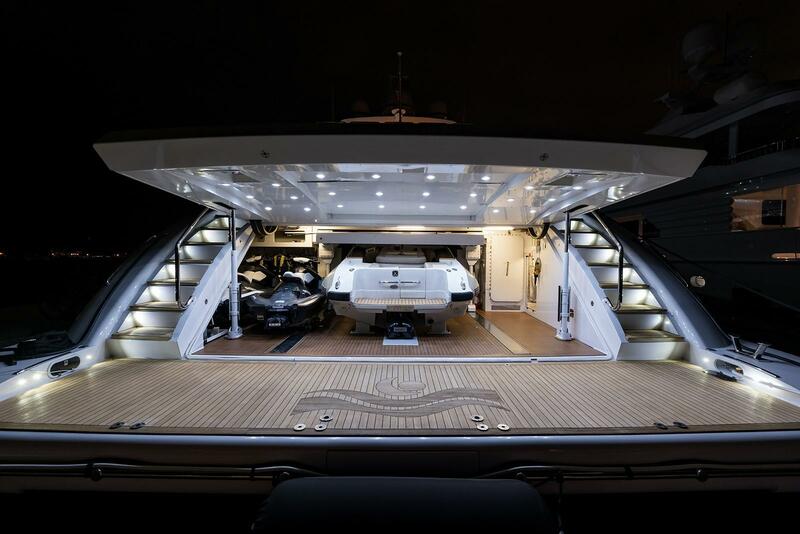 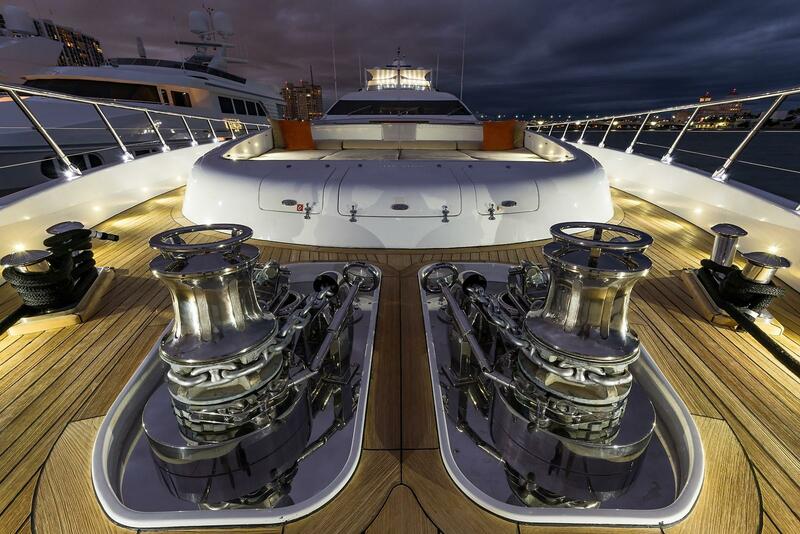 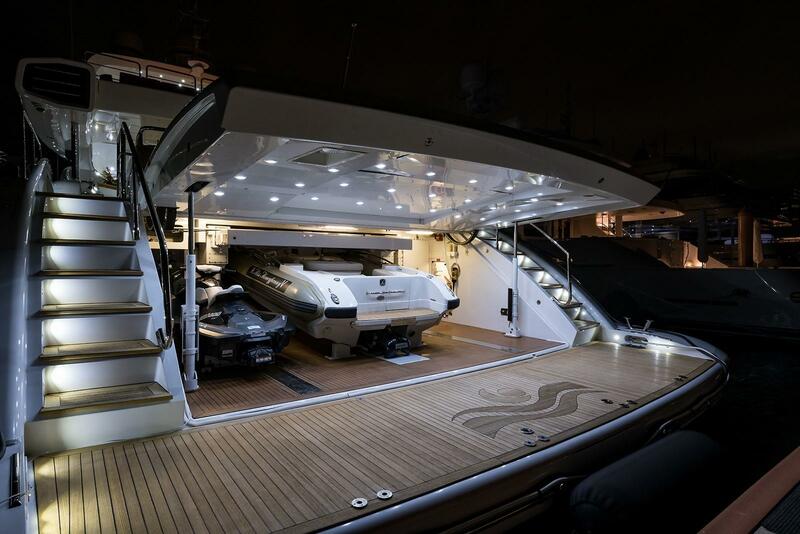 Five oversized sunbeds run across the aft end of the flybridge. 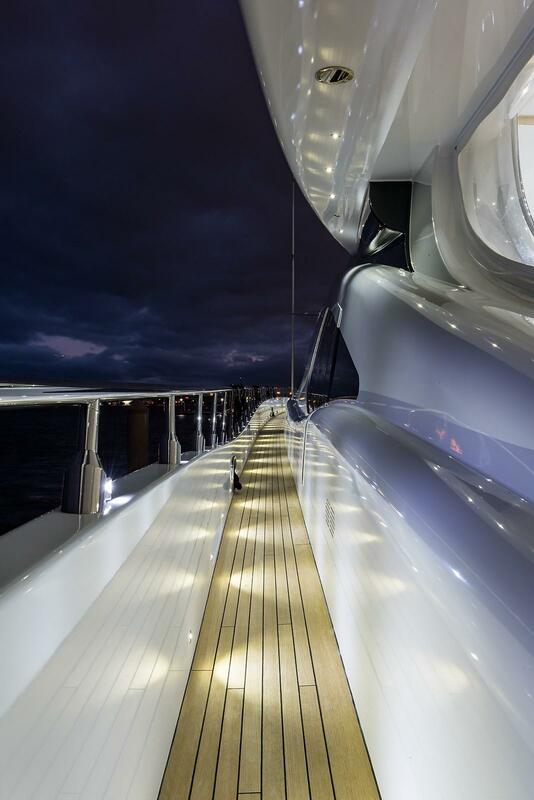 The arch overhead supplies the right amount of LED light for night time use. 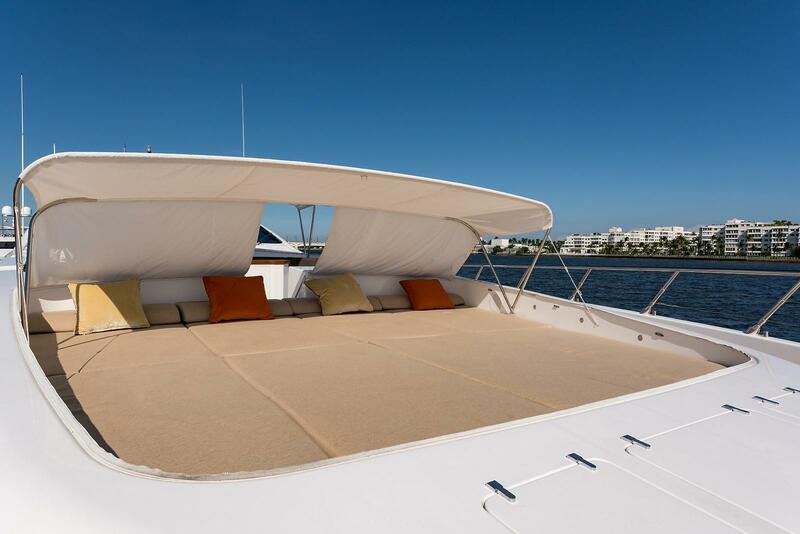 The most exciting place on the boat at sea accommodates the large sunk in sun pad forward with electric buggy top for a touch of shade at rest. 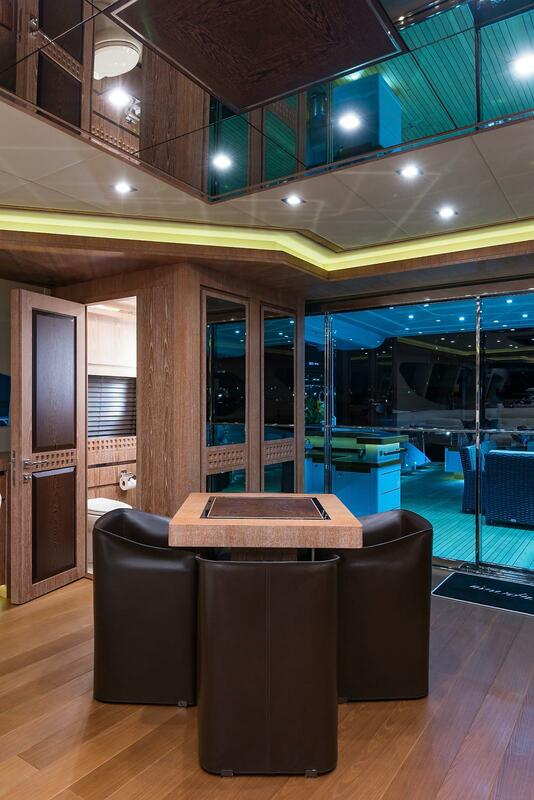 Aft of sun pad is a massive U shaped lounge with new hi gloss teak extendable table and two chairs center for dining or even watching television that is housed in a cabinet forward. 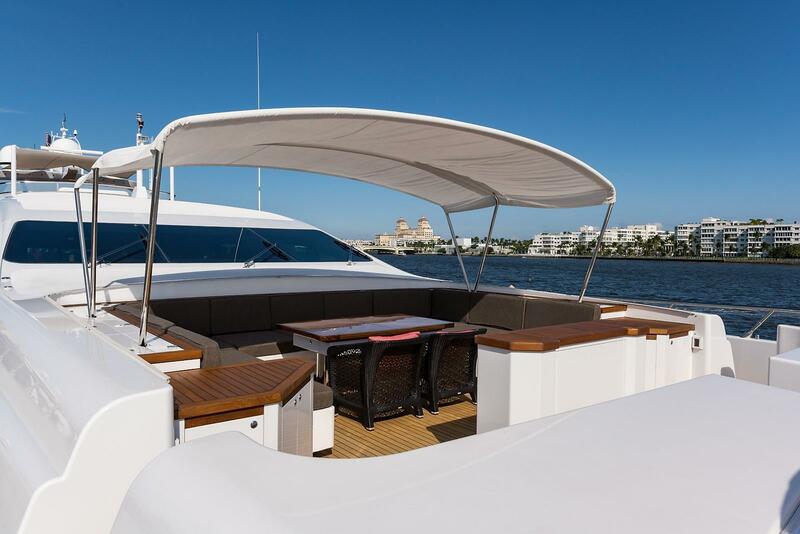 A complete bimini top can be raised electrically for full shade at rest. 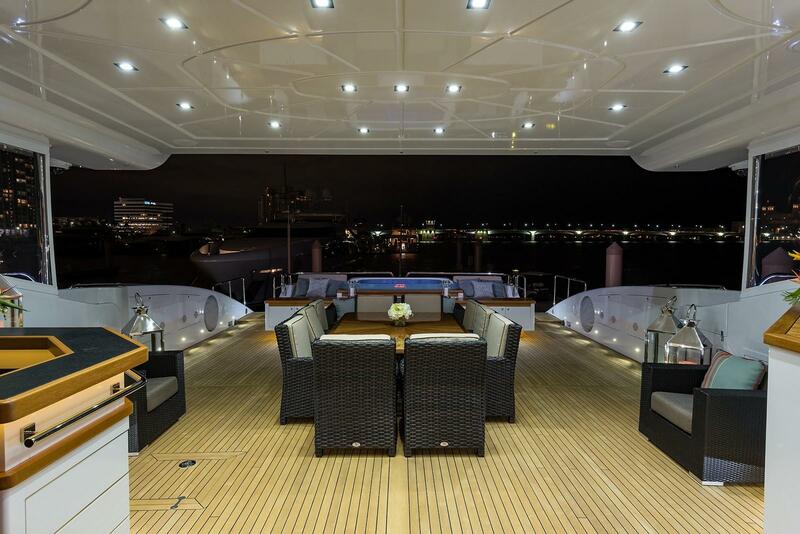 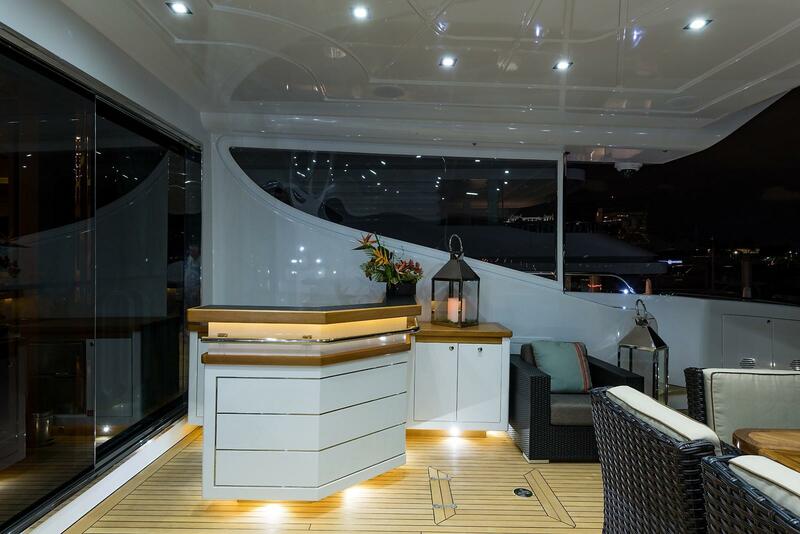 The massive aft deck seamlessly joins the salon with an additional new high gloss power Hi/Lo teak table with seating for 10. 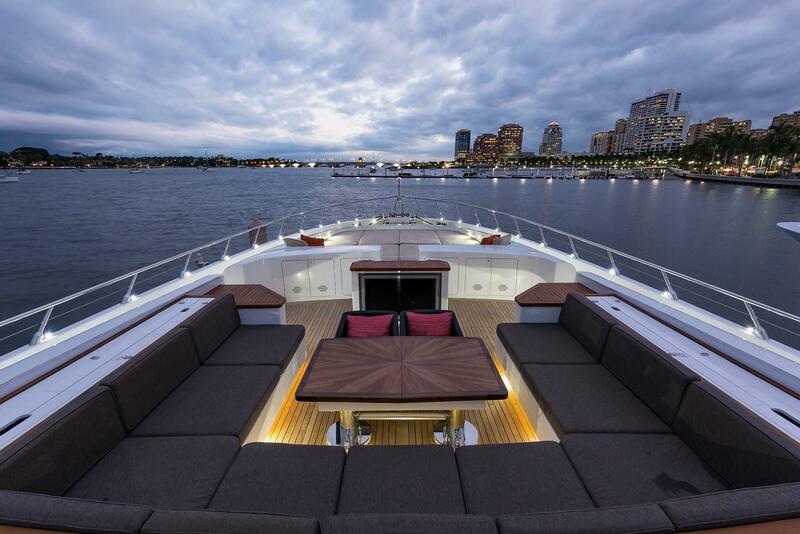 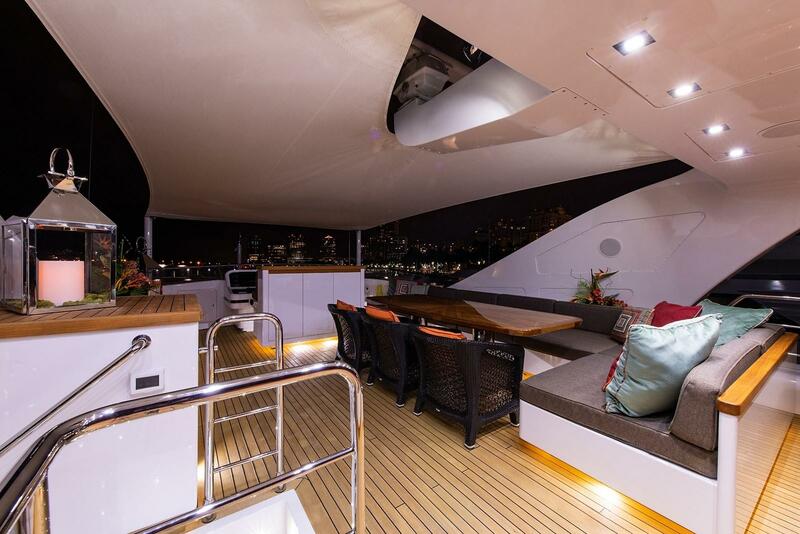 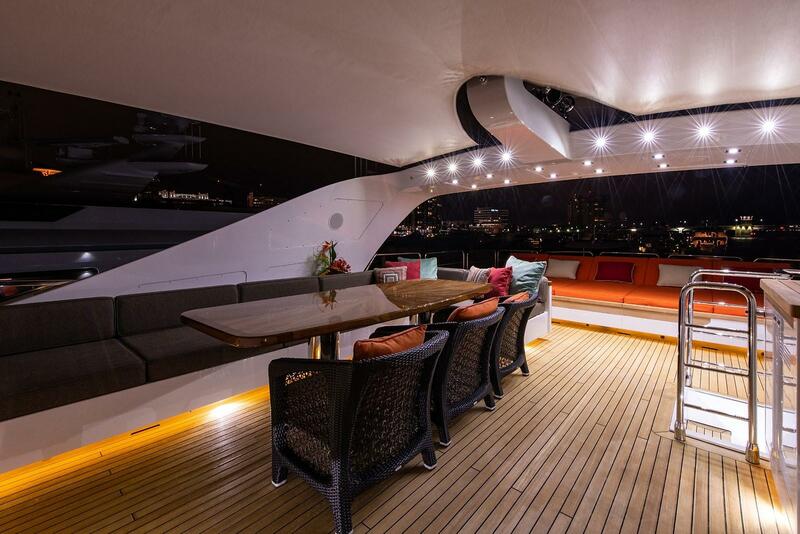 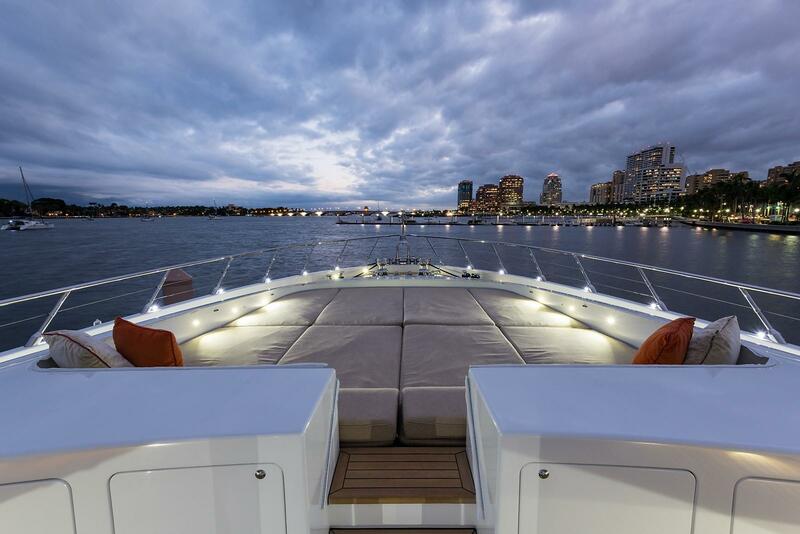 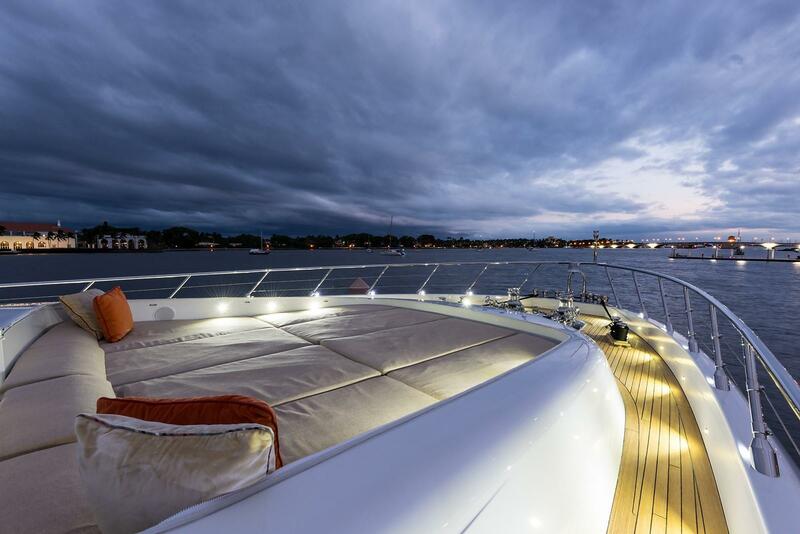 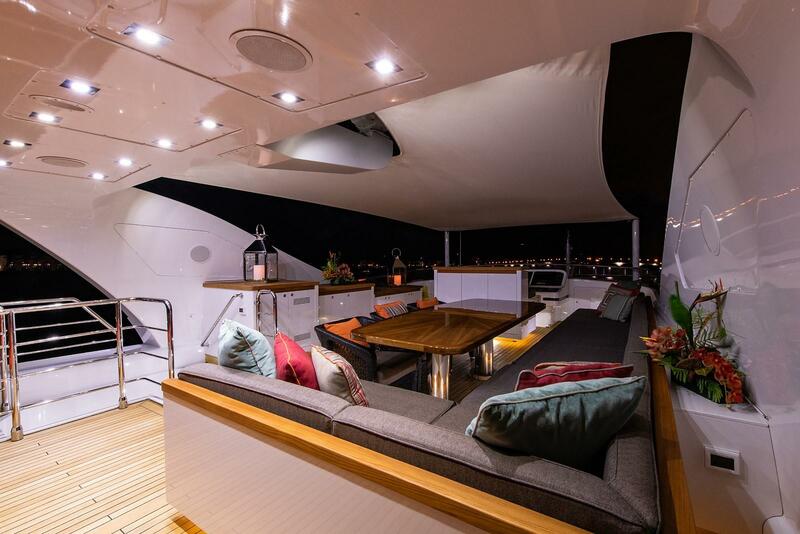 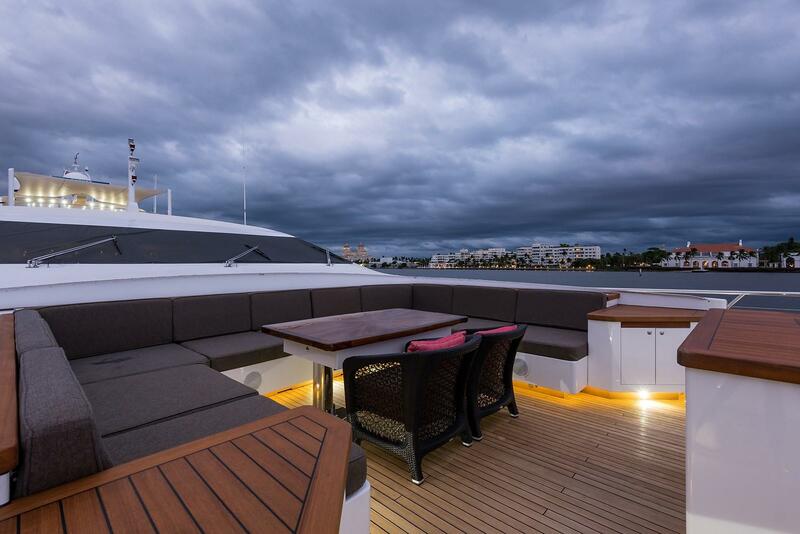 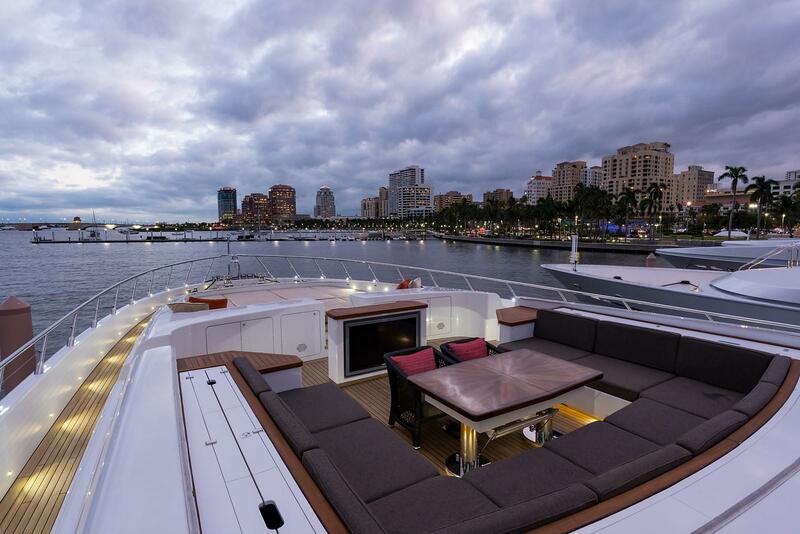 Located partially under the flybridge overhang, the power awning can completely shade the area. 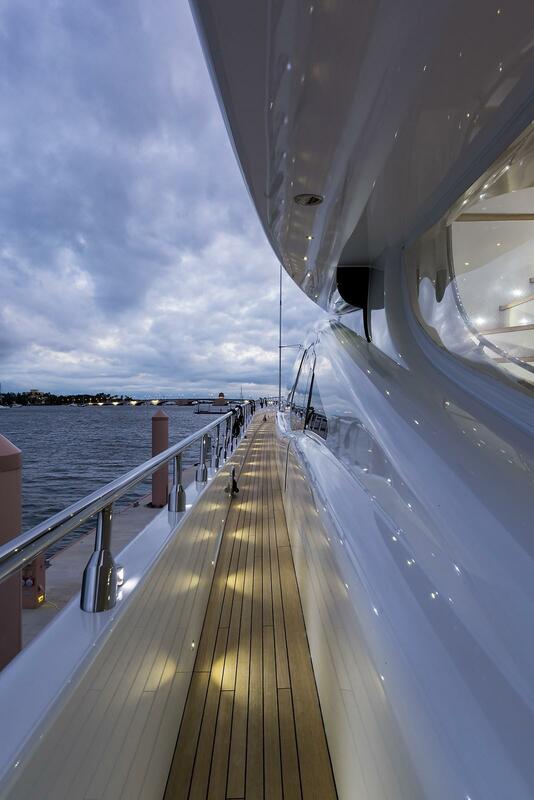 Additional wing enclosures made of clear EZ2CY reduce the wind and weather. 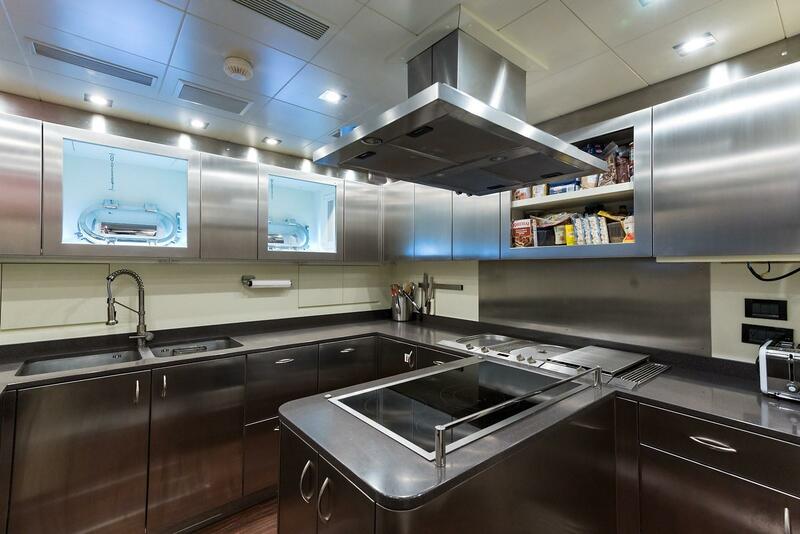 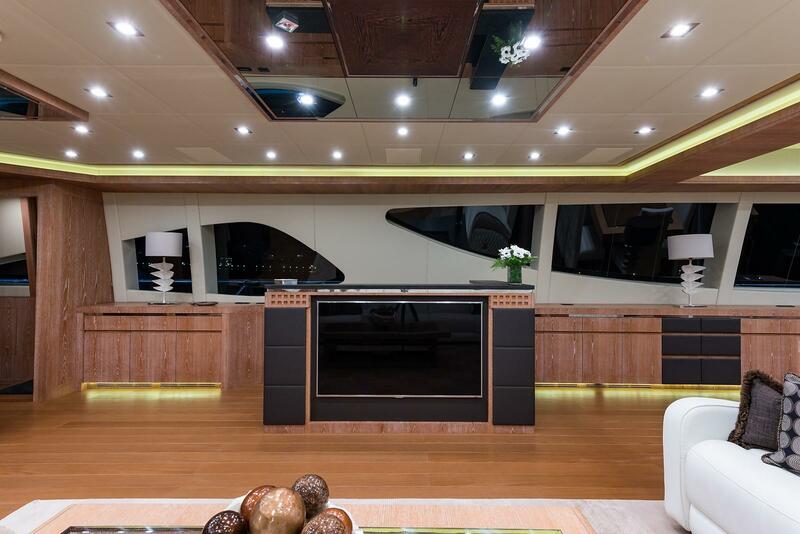 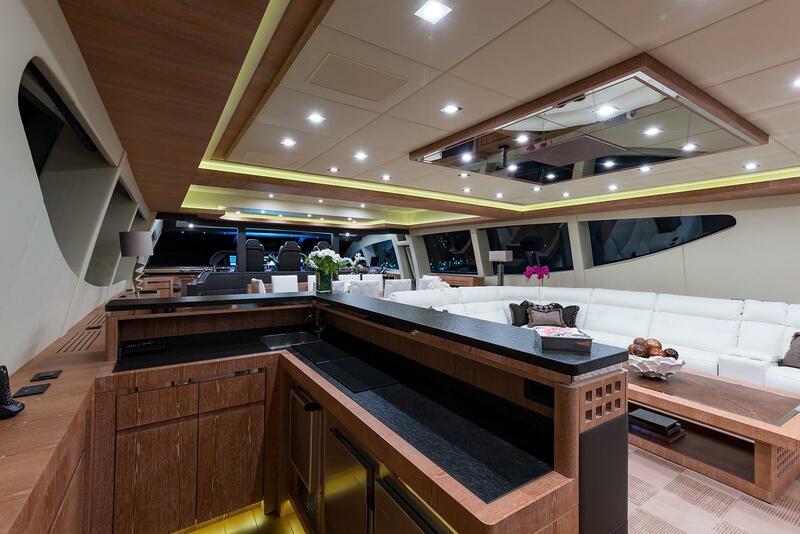 A full wet bar is to starboard with custom refrigeration and ice machine, sink and storage. 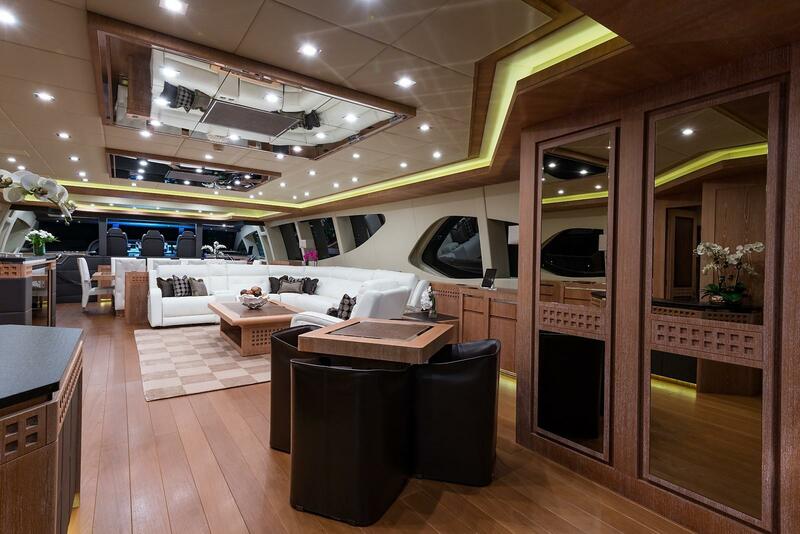 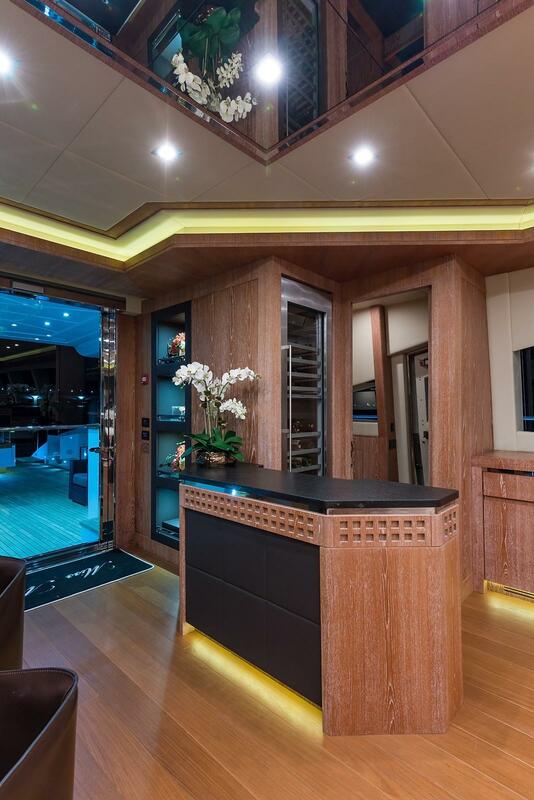 To port forward is the aft deck pop up television and cabinet along side of the oversized molded staircase to the flybridge sundeck. 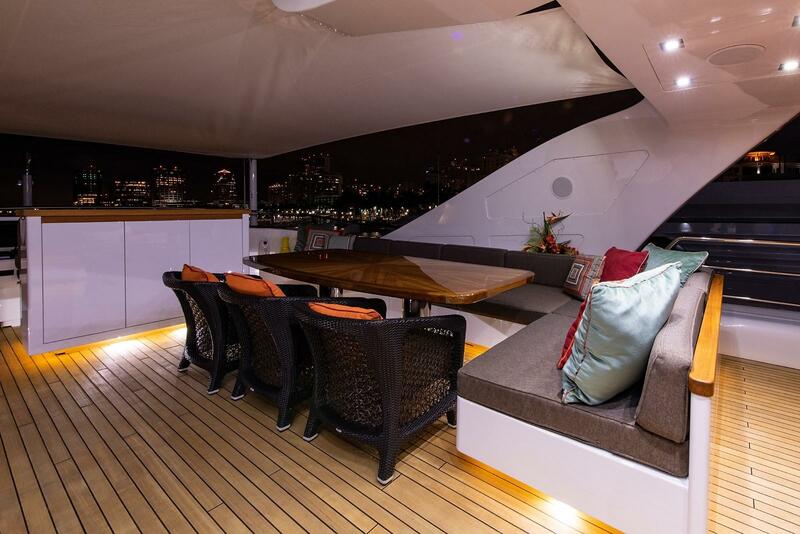 Free standing aft deck furniture include two oversized chairs and additional couch aft. 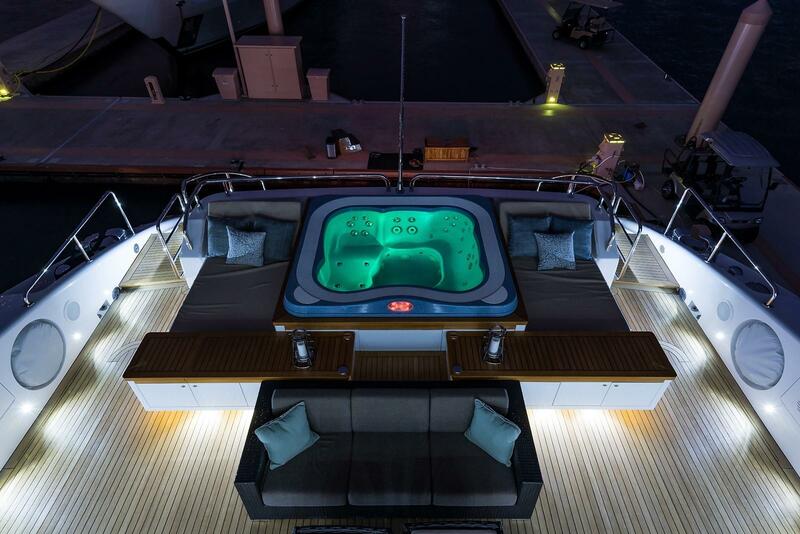 All the way aft is the centerline jacuzzi flanked by two chase lounges. 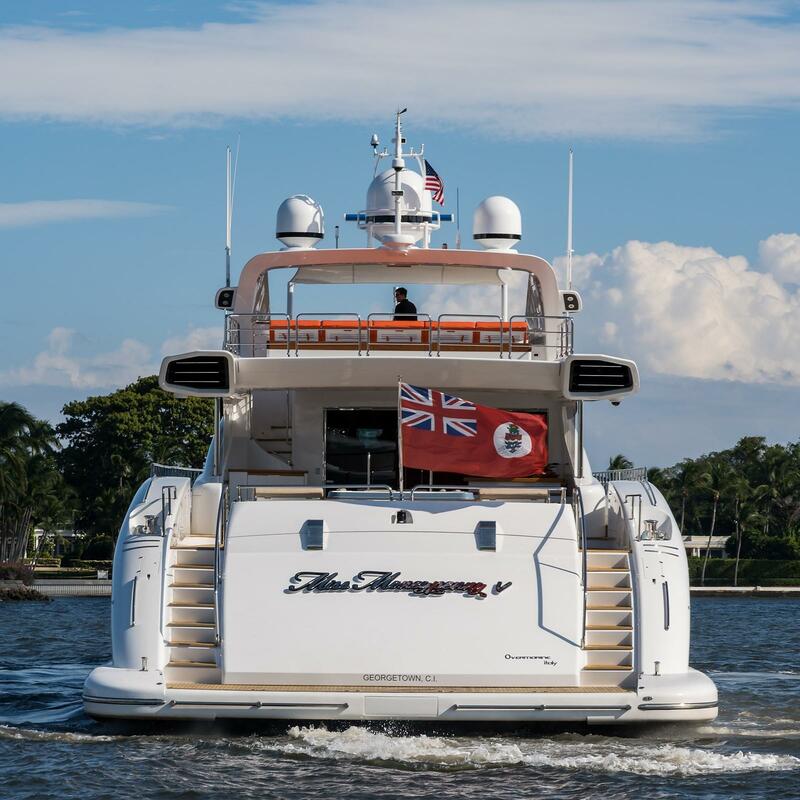 Transom steps take you to the waters edge and beach club garage housing the tender and two jet skis as well as a rainfall shower at the top of the power swim ladder. 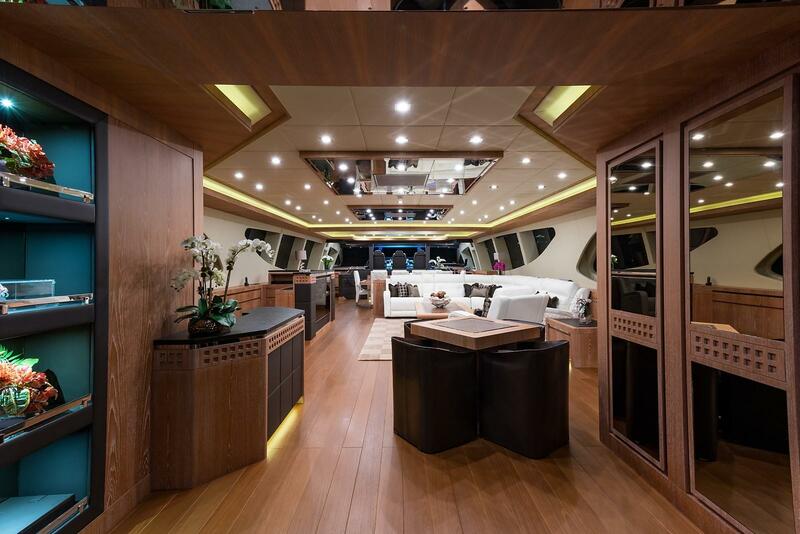 The starboard side transom steps hide the passerelle for stern boarding. 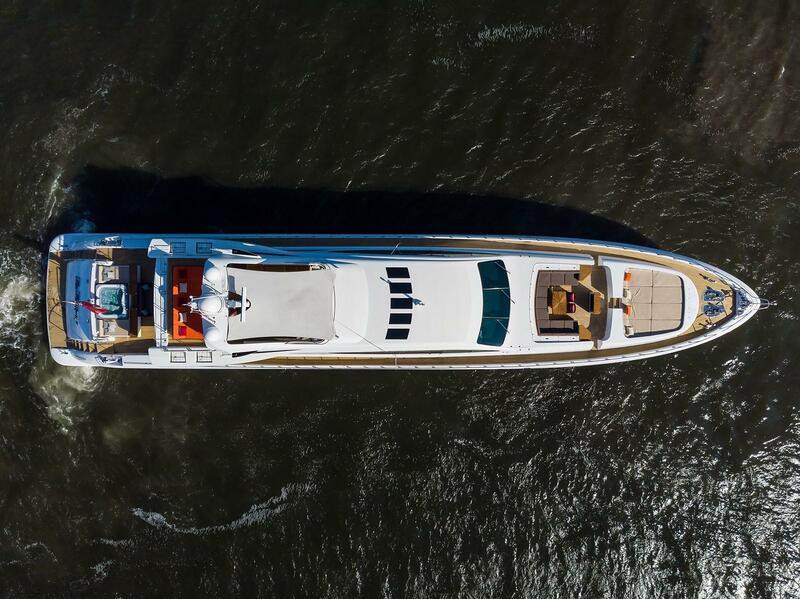 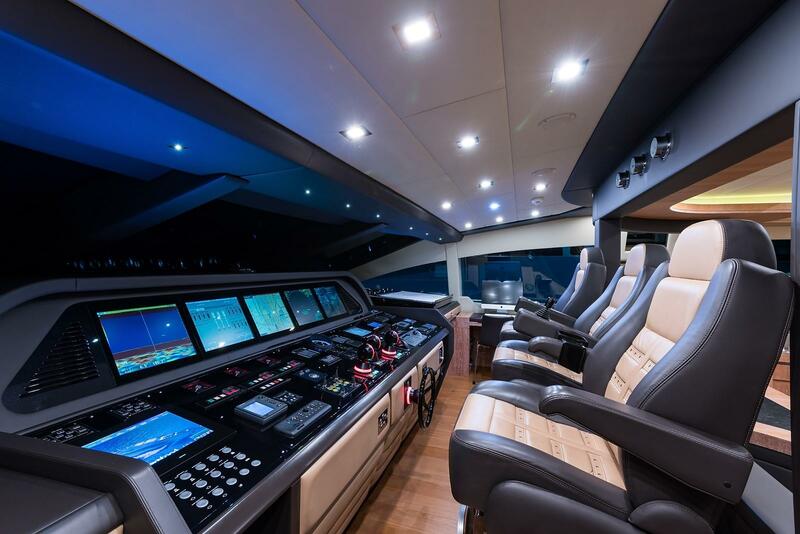 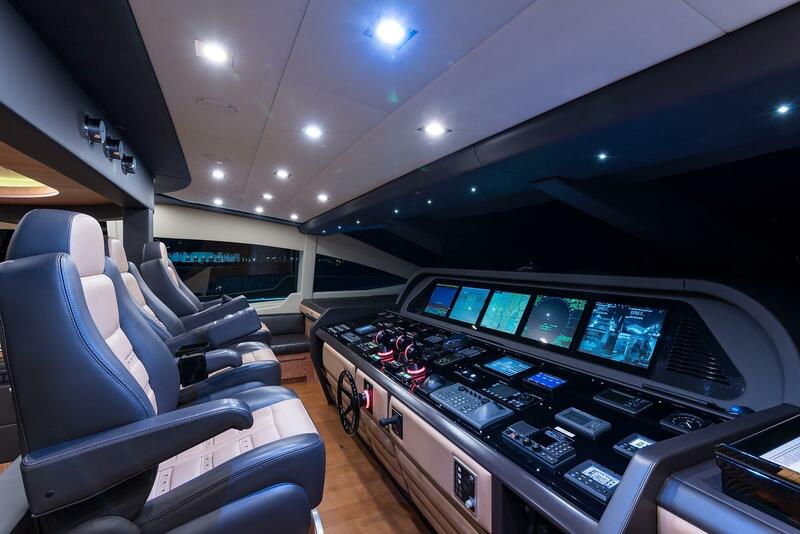 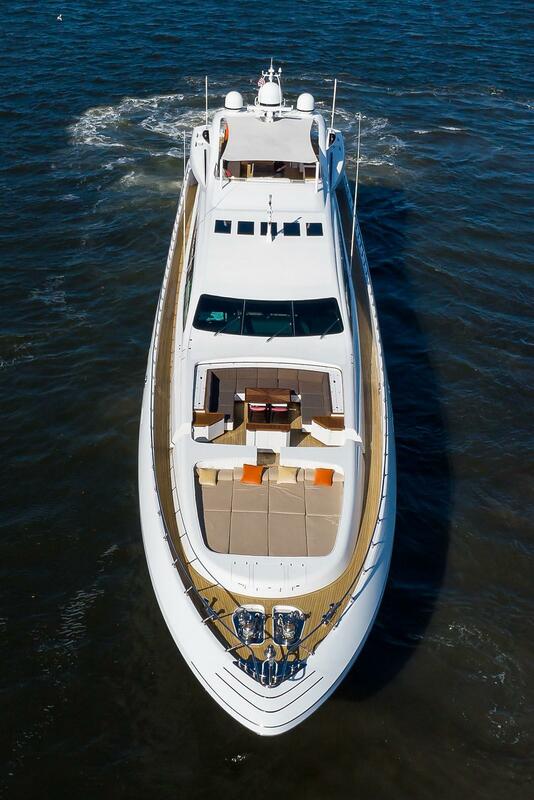 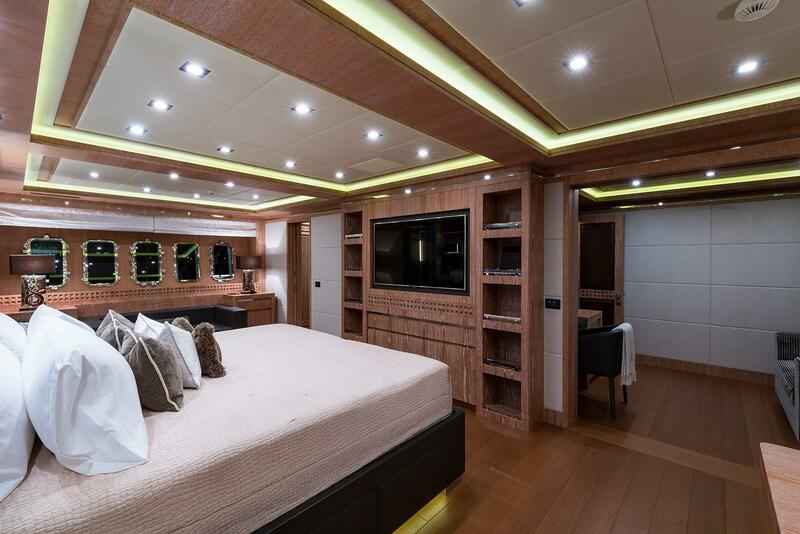 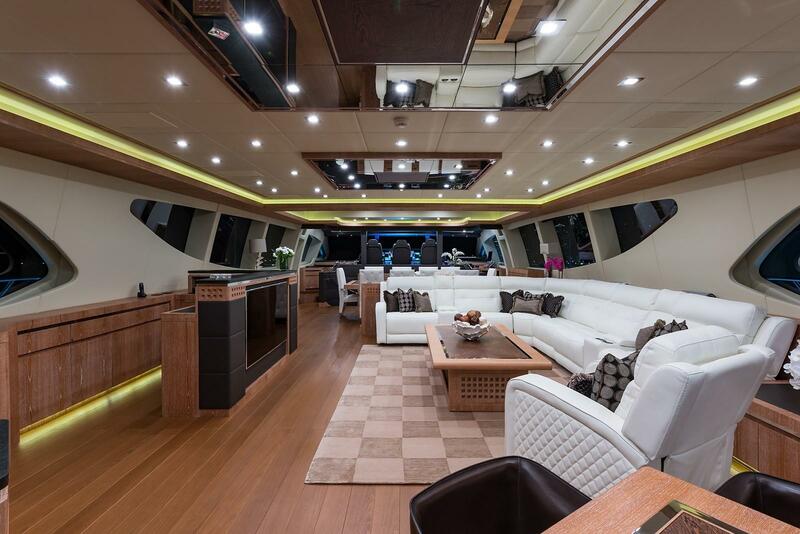 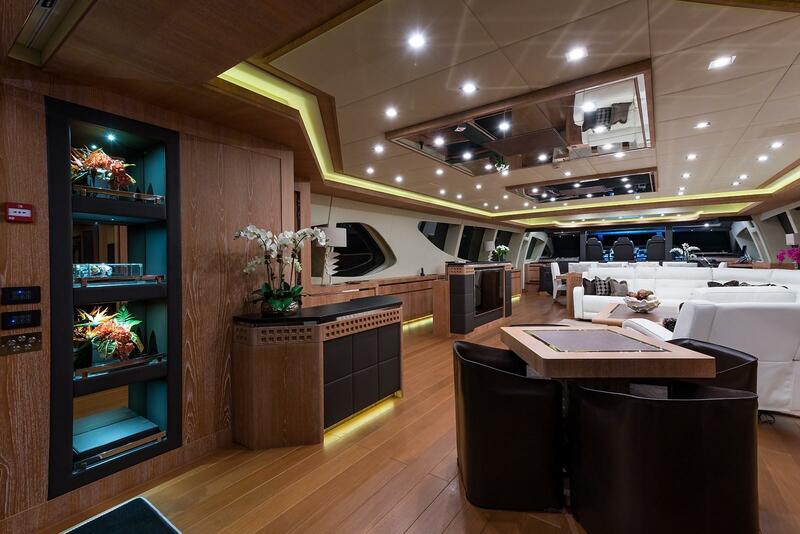 Miss Moneypenny V is fitted with Satellite TV and entertainment systems including a Kaleidoscope entertainment system for music and movies throughout the yacht. 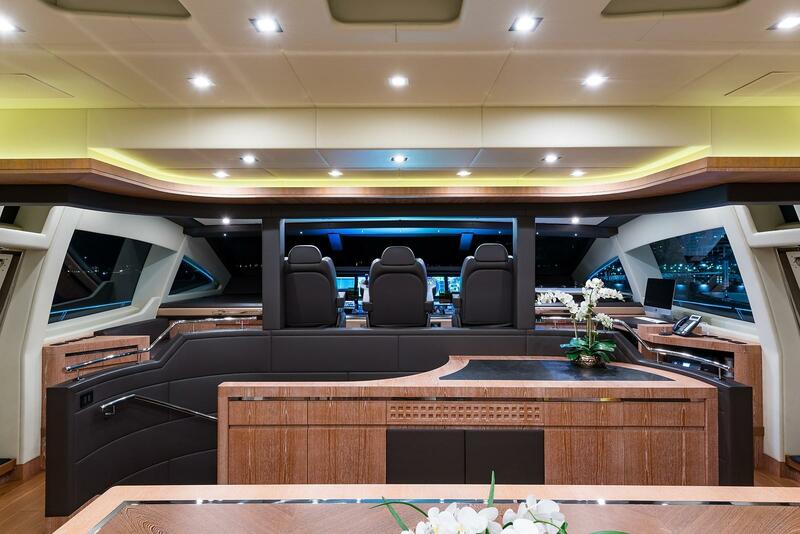 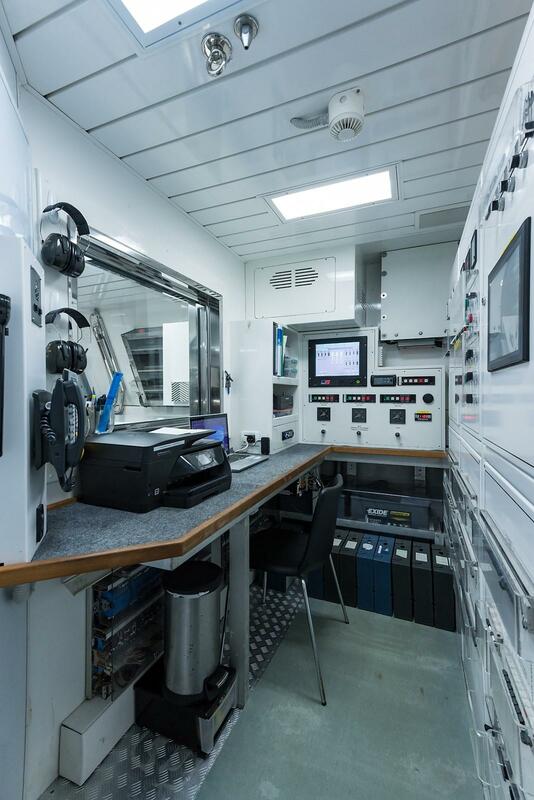 TV, VCR, DVD – Samsung TV’s throughout vessel including crew mess and cabins, fly bridge, aft and fore decks, Apple IPad’s throughout (except crew cabins) Stereo – Denon AV Surround receivers with all TVs, Crestron control system Acer ships monitors in crew mess, captain and engineers cabins.